Baxter served as Philadelphia's Water Commissioner for many years. One of the City's water treatment plants now bears his name. Michael C. Robinson, executive secretary of the Public Works Historical Society, prepared the following biographical sketch. It first appeared in the APWA Reporter 49 (March 1982). One of the leading lights of the public works profession has been extinguished. When Samuel S. Baxter passed away on February 7, 1982, the City of Philadelphia and the nation's engineering community lost an individual of exemplary ability, character, and charm. The roll of his accomplishments is long and enviable, but perhaps his most lasting and memorable legacy was his rare personal qualities. Sam Baxter was truly a public works man for all seasons, who, in the conduct of his professional and personal life, served as a paradigm for other engineer-administrators. He was self-effacing, bold, creative, competent, and adhered unwaveringly to the canons of his church and profession. Furthermore, he displayed a high degree of sensitivity to people, political acumen, ethical courage, and level-headedness under pressure that few public works leaders possess. With the exception of military service during World War II, Sam Baxter spent his entire life living and working in Philadelphia. He was born in the city on February 6, 1905, attended public school, and graduated from high school in January 1921, just before his sixteenth birthday. He obtained a job with a sporting goods firm, but spent his evenings at Drexel Institute (now Drexel University) studying municipal engineering. One of his instructors was Thomas Buckley (APWA President, 1937), who was a senior engineer for the city. Buckley encouraged Baxter to take a civil service examination for a surveying position, and the young man became a chainman in a district field office in February 1923. Thus began a 49-year career of service to the city of Philadelphia. From 1923 to 1932, Baxter gradually moved up the ranks in various positions in the field and central office. The work included project designs, property surveys, and field engineering in connection with sewer, water, and street projects. In 1932, Buckley (who had become assistant chief engineer and surveyor) offered Baxter the job of reorganizing a division that had jurisdiction over city plan works, project title records, and similar responsibilities. At that time, the city was laying off a number of employees due to the Depression, and Baxter accepted the job despite a $300 reduction in pay. The young engineer displayed outstanding management and organizational abilities that caught the attention of superiors. Buckley and others gave him a series of difficult special assignments during the 1930s. In 1937 he was placed in charge of preparing plans and working with the State Highway Department on a series of street construction projects in the city. In 1938, John H. Neeson, Chief Engineer of the Philadelphia Department of Public Works (and President, 1931-1932, American Society of Municipal Improvements, APWA predecessor organization) made Baxter the coordinator of WPA projects in the city. Rarely has a public works administrator been given such a varied and challenging task. The projects ranged from making doll dresses to building highway ramps, from copying old records to renovating the exterior of Independence Hall. The complicated and frustrating job brought Baxter to the attention of Mayor Robert Lamberton. Thus, at the age of 35, he became Assistant Director of Public Works, jumping over other more experienced engineers, including Tom Buckley, his patron. The new job gave Baxter day-to-day responsibility for a broad range of public works, including water, sewage, streets, highways, airports, public buildings, and street lighting. In the late 1930s, Baxter joined the army reserves in the Administrative Corps of the Medical Department. After being called to active duty at the outset of World War I, he was able to gain a transfer to the Corps of Engineers and was assigned to build an airport in Philadelphia (now North Philadelphia Airport) Baxter next received one of the most interesting assignments of his career. The top-secret Manhattan District of the Corps of Engineers was seeking engineer officers, and Baxter landed the job of designing, constructing, and operating the entirely new town of Oak Ridge, Tennessee. On a virgin hillside in a relatively remote area, Baxter was in charge of creating a town to house 70,000 scientists, engineers, and workers engaged in the atomic bomb project. As the town manager, his duties included renting housing, organizing and financing a new school system, and finding managers for department stores, beauty shops, and a host of other services. After several other military assignments, Baxter returned to Philadelphia as Assistant Director of Public Works. In a subsequent departmental reorganization, Baxter went back to the Bureau of Engineering and Surveys, where Tom Buckley was Chief Engineer and Surveyor. Due to the Depression and war, there was a tremendous backlog of work on bridges, water plants, sewage treatment plants, airports, and many other projects. He was given the title Projects Engineer, later Chief Engineer, and placed special emphasis on the design of a number of sewage treatment plants built during the 1950s. Other important assignments during this period were the design and construction of a new terminal building for the Philadelphia International Airport as well as the Walnut Lane Bridge, the first prestressed concrete bridge built in the United States. The adoption of a new city charter in 1952 brought about a dismantling of the Public Works Department and the creation of several new departments to carry out public works functions. A Water Department was established with responsibility for all functions relating to water, wastewater, and stormwater, including design, construction, operation, and maintenance. By charter it had the unique requirement of having to operate entirely from revenues, and it was given the authority to set its own rates. 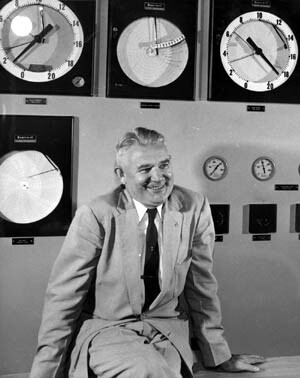 Baxter was asked to become the first commissioner of this department, and served in this capacity until 1972, holding the concurrent responsibility as its chief engineer. Under his leadership, the new sewage plants were built in the 1950s, and three water plants were completed by 1965. Rapid sand filters replaced the old slow sand plant. In addition, meters were installed for all users, and an intensive program was launched to renovate and replace older water and sewer lines as well as construct larger storm sewers. The rate schedule was modernized and regularly updated, and the department was placed entirely on a self-sustaining basis. Furthermore, due to the strong engineering talent Baxter attracted to his department, he was often involved in other construction projects such as stadiums and airports. Somehow Baxter also managed to serve as the city's emergency coordinator during this 20-year period. In this capacity, he had the authority to draw upon the resources of any city department to respond to emergencies. The work covered abroad spectrum of problems -snowstorms, floods, building collapses, gas explosions, and of course water main breaks and sewer collapses. Such incidents occurred periodically and resulted in Baxter being called out day and night. Despite his Republican registration, Baxter was appointed to five terms as water commissioner by Democratic mayors. But in 1972 the new mayor did not reappoint him and he left the city after 49 years in public works positions. After 1972 he conducted a private consulting practice in water resources and public works, generally assisting large engineering firms. Baxter was one of the last of a breed in the engineering field that rose to high position without having earned a college degree. He was always active in numerous professional organizations and served as president of three: the American Public Works Association (1947), American Water Works Association (1966), and the American Society of Civil Engineers (1971). Locally Baxter served as President, Philadelphia Council, Boy Scouts of America; Chairman, Drexel University Alumni Association; Chairman of disaster services for the American Red Cross; and a board member of the Methodist Hospital. He was a Director of the East Girard Savings Association from 1929 until his death and had been Chairman of the Board since 1964. This spring the Public Works Historical Society will publish an oral history interview held last fall with Samuel S. Baxter. It is the society's hope that it will capture the legacy he left to his city and professional peers. We all miss you, Sam. Robert D. Bugher, executive director of the American Public Works Association, and Michael C. Robinson, executive secretary of the Public Works Historical Society, conducted this interview with Samuel S. Baxter in Philadelphia at the offices of the East Girard Savings Association on November 10 and 11, 1981. Robinson: Sam, are you a lifelong citizen of Philadelphia? Baxter: Yes. I was born and lived here all my life except during the war years. And my war was World War II, not any of the others. Robinson: Has your family lived here for several generations? Baxter: My mother and father were the only ones who lived in Philadelphia practically all their life. Although my mother was born in Ireland, she came to Philadelphia as a young girl. Robinson: What year were you born? Robinson: Could you give us an overview of your early elementary education? Baxter: At that time, I lived in what was known as the Fishtown section of Philadelphia. A lot of fish were put on the market from the Delaware River. I went to elementary and grammar schools in that part of Philadelphia. They were boys' schools, no girls in them and then I went to Northeast High School in Philadelphia, which was also a boys' school. So all of my education up through high school was in public schools in Philadelphia. Robinson: What was your father's profession? Baxter: My father worked for the Pennsylvania Railroad all of his life. He worked in the freight area in a clerical job dispatching freight. He had a tremendous knowledge of the geography of the United States because of his job. He was somewhat of an ordinary man in one way and yet an extraordinary man in another. He had been born in Philadelphia. His father had come to the United States in the 1850s. He fought with Farragut at Mobile Bay but returned to Ireland shortly after my father was born. My father lived in Ireland and in England until he was maybe 21 or 22 years old. He did some school teaching. My father had interested me a great deal in reading--particularly English novels. I read Tom Swift but I also had English stories. My father brought me up on such things as Walter Scott's books and poems. In that way, he was not an ordinary man because he gave me a fondness for reading. Bugher: Do you have any sisters or brothers? Baxter: I have a retired brother two years younger than I am who is now living in Florida. At one time he was vice president of RCA. And I have a younger sister who is married to a dentist and they are also in Florida. Robinson: In addition to being a voracious reader, what were some of your leisure time interests as a child and a young adult growing up in Philadelphia? Baxter: I participated as a teenage in the Boy Scouts for four or five years. Aside from an interest in reading, my interests were in athletics. I was never big enough to play any kind of formal sports through my high school years. When I was roughly in the college-age group--18 to 28--sports were quite the thing in Philadelphia, played by club teams and all sorts of organized groups. So I had played football and a lot of basketball -what was known as professional basketball. Professional basketball was nothing like it is today. You either did your own job and played basketball at nighttime or, if you were on team-sponsored group, they gave you a nominal job and you played. Robinson: Did the community or area of the city that you lived in have a specific ethnic character? Baxter: The community I lived in until I was married at age 27 had this community background. There were a lot of mills in the area. The mills made such goods as lace, stockings, and the area had a lot of the people who had moved from England, Ireland, and Scotland who had been doing that kind of work in the mills in Great Britain. So that part of the community was known for its soccer teams. The high school that I went to won the soccer championship for about 30 years in a row, mainly because the boys in the high school had parents who had played soccer. Robinson: In addition to athletics, were you or your parents active in any other community or church organizations? Baxter: I picked up an interest in church work as a youngster and at that time belonged to a Presbyterian church in my neighborhood, and participated in the usual work of the young people's organization. I soon became a leader on Sunday night, and sat at meetings attended by my peers. I look back and say it was one of the best things to give me training in public speaking because I' d get up maybe once a month before a group of people my own age and talk. Robinson: Were your interests in public works and engineering kindled while in high school? Baxter: It was kindled while in high school primarily through a teacher. If you can imagine teachers in high school wearing frock coats and white beards. He was one of those. He sponsored the engineering and the surveying teams or clubs in high school. It was through him that I developed an interest in engineering work. Robinson: While in high school, did you consider entering into any other profession or did you have any other great interest? Baxter: I didn't consider it at that time. To a certain extent, my own parents didn't think very much of having their youngsters go to college, or go into the professions. It was a neighborhood where you worked in a factory or office. Robinson: Did you engage in any part-time work while you were in high school? Baxter: Yes. I made chip baskets. Chip baskets are something you don't see much on the market anymore but they were made with thin strips of wood woven together. They were used to carry things. The factory was close to where I lived so I worked frequently after school. Robinson: What kind of social activities were available to youth in those days? Baxter: The high school classes would run a couple of dances at a nearby country club. The churches had meetings from time to time. I think I was somewhat left out of that, mainly because I had skipped so many grades in primary and grammar school. I was roughly two years younger than the men in my high school class. Robinson: I take it that you were an honor student? Baxter: No. I had normally good grades, but I was just younger than the rest. Actually, I graduated from high school before I was sixteen years old. Robinson: What year did you graduate from high school? Robinson: What was the name of the high school? Baxter: Northeast High School, Philadelphia. Robinson: Did you take up an occupation as soon as you graduated? Baxter: First of all I'll tell you about the high school courses. During those days, the high schools (at least the one that I attended) had three courses that you could choose. One was called an academic course. These were intended primarily for men who were headed toward college. The second was called the manual training course, which gave training in manual work. And the third was a commercial course in which you learned commercial things ranging from how to run a typewriter to bookkeeping. I took the manual training course and that course included all of the academic subjects that the academic group took, except that we were not required to take one of the classical foreign languages, Greek or Latin. We still had to take three periods each a week of metal work and woodwork --ranging from making molds, pouring lead, chipping and filing on iron work, tinsmith, pattern making -all of those things in addition to academic work. Robinson: Was it an asset to learn to work with your hands? Baxter: I think it was an asset. It served me very well in my work later on in life, particularly when I was managing a public works department that had machine shops that did mechanical work. Robinson: When you graduated from high school, did you have any professional ambitions at that time? Baxter: None, Mike. The main point was that '21 '22 was a depression period. Everyone needed to work, there were children in the family and I worked in an office for about a year, a mill a couple of blocks from where I lived, doing routine clerical work. The mill was the A.J. Reich Company. Reich was a manufacturer of sporting goods that made the American League baseballs. I worked there for about a year until I decided that I wanted to do something else. Robinson: After your employment with the sporting goods company what was your next position? Baxter: I learned that Drexel Institute in Philadelphia (now Drexel University) had an evening college which had several courses. One of them was entitled Municipal Engineering. I applied and entered that school in the fall of 1922. Bugher: You mentioned that in high school you participated in that surveying club? Baxter: In that surveying club we visited engineers and did simple outside surveying work. Bugher: Were any of the people you went to high school with in this evening course? Baxter: Not from any of my classes. I would like to say that that same high school class will meet next week as it has for the last 40 years, so I know for certain that none of them went to that evening class at Drexel. Fortunately, I still had some of the interest that old high school teacher instilled in me. I realized that the clerical job I had at Reich was just something to bring money home in a pretty tight situation. Robinson: Were you still living at home at this time? Baxter: I was still living at home. Robinson: Was your income needed for your family to survive? Baxter: I think it was. My father had just an ordinary railroad job. Bugher: What were some of the impressions that you have of that period of Philadelphia and the environs in which you lived during the 1920s. Was there a lot of construction going on? I would think there would not be very much during the depression. Baxter: There wasn't very much during that time. In the late 1920s, however, Philadelphia did start to do a lot of things. It got interested in the fact that there was a sesquicentennial exhibition in Philadelphia in 1926 so a lot of things went on as part of it. Then things got better in the whole country toward the latter part of the 1920s. We were heading for another real depression but nobody knew it. Bugher: How did you get around? Did you come downtown much in those times? Baxter: Most of my work with the city from the time that I started (1923 until 1932) was in a district office in one part of the city, which brought me downtown infrequently. The only time that I would come downtown would be the normal shopping times because in those years, the main commercial centers were all in the center city. There were none of the satellite communities that we have today. Bugher: Did they have streetcars? Baxter: Yes. The city had a big streetcar family. At its time, it was supposed to be a pretty good one. The management was supposed to look after its employees. My parents traveled frequently around Philadelphia because my mother had four sisters living here and the way you got around in those days was to ride the trolley cars. Before I was five years old I learned the streets and could call them out ahead of time. This gave my parents real problems, because they could never convince anyone that a four-year-old could name the streets. A four-year-old didn't have to pay any fare. And a nickel meant a lot in those days. Bugher: How did you get to Drexel? Baxter: By that time, an elevated system had been built. It made it very convenient for me to go to Drexel as it goes within one block of the university and the station was only a few blocks from my home. Bugher: And you did that in the evenings a couple of times a week? Baxter: Three or four times a week. Robinson: Were the individuals in your class similar to you? From working-class backgrounds? Baxter: Most of them were as I remember. I worked outside in the wintertime and the work was semi-physical. I was not working as a laborer or anything but was hauling things around and driving stakes. By the time I had been out in sub-freezing temperatures and then got into a hot schoolroom, one of the battles was to keep awake. Bugher: Was that before you went to work for the city? Baxter: I started Drexel in September of 1922 and this is where I first met Tom Buckley because he was teaching the surveying class. He was the one who suggested that I take a civil service examination to get a city job. I went to work for the city in February 1923. Robinson: So you continued to go to school after you went to work for the city? Baxter: Yes because the course that I took was called Municipal Engineering. It included surveying work for construction and land surveying, highway construction and maintenance, waterworks: all of the things relating to water from hydraulics to treatment, the same thing relative to sewage treatment. They also taught structures and city planning. Robinson: Do you happen to recall the authors of some of the early textbooks you used in those courses? Baxter: Yes. I had reason to actually go down in my basement to pull it out to be sure because of a Public Works Historical Society essay. The article was on Nelson Lewis. I went down to the basement to look for my textbook on city planning and he wrote the textbook. Robinson: He was a past president of our association. Bugher: Can you remember others at Drexel in those years on the staff besides Buckley? Baxter: Nearly all the instructors were part-time adjunct professors. Robinson: Were many of them city employees? Baxter: Yes and civil engineers in the area. Robinson: Do you think the fact that they were practicing engineers brought a certain practical quality to their instruction? Baxter: I think it did, especially someone like myself, working for the city in a minor capacity. These were people involved in real activities. To have somebody talk about their day-to-day problems helped you realize it wasn't a theoretical thing but rather something you could see. On a lot of occasions, instructors would take us to work on Saturdays, not as part of the schoolwork but just as part of their interest. Bugher: How big of a student body did the school have? Baxter: At that time about 5,000. Sometime in the 1930s, the evening college program granted a full bachelor's degree. Robinson: Were you able to obtain a degree? Baxter: No. We didn't have at that time any of the courses now that you would try to place in career engineering fields, such as English or any of the so-called social studies. Bugher: Obviously you became a registered engineer later on because of the experience you had. How did you go about this? Baxter: The first registration that I had was as a land surveyor. Bugher: Was that by examination? Baxter: In Pennsylvania during those years there were not the formalities of today, such as required examinations. But my registration didn't come around until about 1940. You could back it up by having worked under somebody who could prove you were qualified. Robinson: Was it during those years that you decided to pursue your career as an engineer? Baxter: That's right. The city job was interesting work. In the early years, a lot of it was outside work -in the field on construction although I did a lot of work inside. Robinson: Do you feel that Tom Buckley played a major part in confirming this decision? Baxter: Without a doubt. I will probably during this interview come back to him in so many ways. He had a particular concern for young people like myself who showed that they had an interest in the work they were doing. I was not the only young man that he showed an interest in. I probably rose higher in the hierarchy than anyone he taught. Bugher: Could you identify some personal traits that might have been responsible for his interest in you? Baxter: The point was that from the very beginning I tried to show that I was ready to go if not a mile farther, at least an inch more than required and maybe do some things on my own. This also applies to another man who helped me a lot. A. Zane Hoffman was in charge of the district office where Tom Buckley and I worked. We had a district office in an old building and I remember one morning that the nails had started to come up on the old wooden steps outside. I got a hammer and went up the stairs and hammered them all down. Hoffman came out and he said something like that's the most sensible thing I've seen anybody do around here. But I guess I just did things like that anytime I saw anything was needed. Later on when we had a chance to do more, I would volunteer. Robinson: What about your day-to-day work? What kind of activities were you engaged in for the city? Baxter: From 1923 roughly through 1931, I worked in a district office that did land surveying, construction surveying, made plans for water lines and sewer lines, and did street-paving work. I also did anything that came under the jurisdiction of that particular district. So I started out the same as any ordinary civil engineering student would--a chainman or a rod man in a survey crew. Robinson: Did you do any maintenance? Baxter: No. There was no maintenance involved. This was new work and after working in the field I was brought into the office to make property plans or to make simple sewer or water plans. Many of the hydraulic designs for the water and sewer plans would be done downtown in the main office. We in the districts would work on the plans and work on the contracts. Bugher: Do you recall if they had a department of public works at that point in time when you first joined? Baxter: This district office was in the Department of Public Works. It was a bureau of the department. Bugher: Who was the director at that time? Baxter: It was a part of the old Bureau of Surveys in the Department of Public Works which had been established somewhere in the mid-1800s. The main Bureau of Surveys was a misnomer because not only did it do surveys it did all the engineering work for the city. In the 1920s, the director of public works was a man named George Biles. He was reasonably well known, at least in Philadelphia. Robinson: Sam, as a young man in the 1920s were you active in professional activities? Baxter: Yes I was and I think that's another important thing that kept me going. My involvement began in 1926. I was only 21 years old. I became a junior member of the American Society of Civil Engineers. There is a story behind it. As you recall, I said earlier that was the year of the sesquicentennial, and ASCE held its annual meeting in Philadelphia. Zane Hoffman was on the big committee to set up all the arrangements. One of the arrangements was to take the people down to the exhibits at the sesquicentennial grounds, on buses. The engineering and surveying bureaus needed somebody to be on each bus. But they wanted the people to be members of ASCE. I became a junior member of ASCE so I could be a bus conductor. I became active in the American Society of Municipal Engineers (ASME) as did Hoffman. Robinson: Was there a difference in ASCE and ASME in terms of their organization, outlook, and character? Baxter: They were separate. The ASME was a forerunner of APWA. There was the difference because ASCE had taken more difficult engineering problems and a broader aspect of engineering work. The municipal engineers, for example, weren't involved in big buildings, but ASCE was. Municipal engineers weren't involved in any coastal work and river dredging, although there was some interest in Philadelphia. Municipal engineers were primarily interested in municipal work: highways, airports, sewage plants. Robinson: Did the municipal engineers' group also include private sector people? Baxter: It included consultants at that time but not as many as we have now. In its early days (1920s) it was actually confined to city of Philadelphia people. Later on it broadened out (1930s) to take in the surrounding metropolitan area. Robinson: What were some of the professional activities of ASME? Baxter: The Philadelphia group conducted annual meetings and an annual banquet. At one stage, I was involved in selling tickets at another I worked on the dinner committee. It was not so much the importance of my involvement but you had to start some place. I was reasonably well known. Well known enough, that by 1937 I was the president of the Philadelphia Chapter. Buckley and Hoffman particularly got me interested in the beginning. Robinson: Did the group involve people such as foremen and superintendents in addition to engineers? Baxter: It did, especially in such things as the annual dinner when it wanted a great big group of people to come out. Its normal meetings involved more the professionals and the paraprofessionals and the senior operating people -people who would be superintendent of the incinerators, for example -people who would not normally be engineers, but nonetheless an important person. We're talking about the late 1920s and early 1930s. Robinson: Did you go to any of the national meetings during this period? Baxter: I started to go to the national meetings. The first one was in 1938 in Rochester. We sent a delegation up there and we paid our own way. These were very tight years for cities. Robinson: How many people would you get to an annual meeting in those days? Baxter: Probably a couple of hundred for a national meeting. Bugher: You mentioned in your remarks down in Atlanta that the Philadelphia Chapter was a substantial percent of the total. Baxter: Of the total membership. Bugher: We had 700 or 800 members at that time and I think Philadelphia had like 235 or 260, something like that. Baxter: Those figures are correct. At least they're in the annual report of one of those years. Robinson: Do you recall what some of the issues and concerns were of the municipal engineers in those days--the kinds of subjects that people would be speaking on at chapter meetings? Baxter: Believe it or not, they were some of the same ones we have today. One was, particularly in the 1930s, We don't have enough money for maintenance. People like Sam Greeley and others were outspoken on that subject. The Public Works Administration (PWA) program of the federal government and the Works Progress Administration (WPA) were very important items in those days. So one of the questions of those days was how do we handle those things? Where do we get our share of the PWA when we don't have any money? This is similar today -where do cities get their share to participate in some federal programs? Bugher: Back at that time you were pretty much concentrating on surveying and other technical aspects? Baxter: I was not involved in surveying at that time. My title was assistant engineer in what was then called the Bureau of Engineering and Surveys. With my left hand I had certain record-keeping functions under the title of registrar. I had certain city planning functions as well as all sorts of odd jobs thrown at me by Tom Buckley who was by then my immediate superior. Bugher: I gather that you weren't involved in PWA projects but you were involved in the WPA? Baxter: Right. I was put into that. Bugher: But didn't the city get into that (PWA), too? Baxter: The city did very little about it. But what the city finally did at the tail end of it was at least arrange to have contract drawings made. WPA projects were organized quickly. You did them without formal bidding. In the PWA, you had formal contracts, took bids, and there was federal money. The city finally got into it by having plans made for three sewage treatment plants. When I came back from the Army in 1946 and was asked to take charge of the three large sewage treatment plants, all we had to do was to bring those three plans up-to-date and get going. Bugher: So it was feasible to use advance planning? Baxter: It was advance planning that was done. The engineers were Greeley and Hansen. Robinson: Sam, I'd like to back up just a bit to the 1920s, when you were doing your first fieldwork. Did you have a feeling that Tom Buckley saw you as one of the young and upcoming boys in the department? Were you given opportunities for development that perhaps others did not receive? Baxter: I think the answer is yes. Although I wouldn't want to say that others did not receive the opportunity. There were always questions involving both Buckley and Hoffman, who had meetings with the main office people -the public works directors office, and the chief engineers office, many times the city solicitors office for meetings involving problems on legal contracts. If my time was available, they would take me to those meetings even if I had no contact with the project. This allowed me to see what was going on a couple of steps above me. I definitely recognized that they deliberately did it. Robinson: In terms of attention to the professional development of young people, was that a quality you tried to develop as you moved up to higher positions and responsibility? Robinson: From your perspective as a mature public works leader, what qualities in a person indicate he or she has some spark of greatness? Baxter: First of all you do not deliberately look for that. You see it coming out in someone. Someone who goes a little bit further than he has to. Someone who goes in to his superior and says: Well now here's a little bit different way or a better method, may I try that? Once someone does that then they've got your attention. During the time I was water commissioner (20 years) I used about six young men, not all of them engineers, as administrative assistants to the commissioner. They were all people who I expected to rise to top positions in the department. And I wanted them while were young to see what was going on in the boss's office. They had a desk right outside my own office. I took them to meetings the same way I had been taken. If I served on a committee--and by that time I served on many --I'd have that person attend in my place. Then, generally after two or three years, he'd be ready to be moved into a position of higher responsibility. Robinson: Sometimes career development doesn't always payoff for the person who is doing it? Baxter: No it doesn't. But if you say you're never going to do that, then you lose the man who does stay with you. You have to take some losses in order to get some gains. We had a program of tuition payment for men who were taking masters courses at two or three of the universities in the area. We made special arrangements so that if a course was at 4:00 p.m. in the afternoon they could be let off early. All of those men did not stay with us. But many of them did and formed a very fine group of young people. Robinson: Did you take interns in at any point? Full-time college students for the summer season? Baxter: Yes and we had a special reason for doing that. The regular courses at Drexel are cooperative. In other words, students work six months in industry and six months at school and the term to get a degree is five years instead of four. We kept a large number of those co-op students working. Robinson: Do you think more attention should be given to professional development? Baxter: I'd have to say I believe more of this should be done by public works administrators. And I wrote something on that just a couple of days ago. I was writing concerning a conference to be held in the next week or two on the problems of the decay in the infrastructure of the older cities in the United States. And one of the problems is, Do we have enough municipal engineers and what can we do to train them? I say there are two answers to that particular question. One of them is that there are more competent people in the field of municipal engineering and public works than many people realize. But second, municipal and public works departments ought to go after and search out the young people in the schools and somehow interest them. And that's not a theory on my part. During my 20 years as water commissioner, we sent teams of two men to about 20 universities every year to find out who might be interested in working for the Philadelphia Water Department. The team was generally a young engineer who knew the work, and we always sent an administrative person who could answer the questions of salary and how much vacation time, etc. When we found people who were actually interested, we brought them to Philadelphia for a day or two--paid their way and showed them what we had in the Water Department. Robinson: So it pays to stockpile talent? Baxter: It pays to stockpile talent and it pays to go after them. Robinson: When the Depression stuck in the 1920s and early 1930s what was its impact on the operation of the public works department in Philadelphia? Baxter: Basically we had a new mayor who came into office in January 1932. He was faced with the fact that the city was practically broke. Taxes weren't able to meet costs. Thus, he ordered the immediate cancellation of every contract, even for work that was half-started. Every cutback was used, including dropping as many city employees as was possible. Robinson: You mentioned that revenues had fallen off to critical levels. What kinds of revenues were not coming in as a result of the economic downturn of the city? Baxter: The basic revenues for the city you had at that time were real estate revenues. But the real estate taxes were not being paid. Properties were being foreclosed by the hundreds and thousands every month. Since he had stopped all public works construction contracts, and cancelled any that was started, the personnel cutbacks were severe in the engineering and public works departments. Robinson: Who made the decision as to what activities and departments would be cut? Baxter: They were made by the mayor. Robinson: He determined what manpower reductions would be? Baxter: Yes, with maybe abroad designation. Where I was working in the Engineering Division, the number of employees dropped was at least two thirds. A small number were kept to keep some things going. Robinson: These were people principally involved in design and surveying? Baxter: That's right. At that time, Tom Buckley was assistant chief engineer and had the responsibility of making a great many of those reductions. I got involved in it this way. The actual cuts were made June 1, 1932, and I was still working in a district office. I believe I was then getting something like $1,800 a year. That wasn't bad for someone who worked for the city at that time. Buckley told me that I was on the list of people in the classification that was going to be dropped. He had a division in town called the Registry Division whose primary purpose was keeping records of the ownership and size of all the lost in the city. This information was primarily used by the tax office for assessing purposes. He wanted to reorganize that group because it had gotten too much involved in politics. He asked if I'd be willing to take that job. Robinson: How old were you at this time? Baxter: Twenty-seven. Of the twenty-five men in that division, everyone of them was older than I was. Robinson: In addition to what you just described, did the office have any other responsibilities? Baxter: They did reports, made studies, maintained the records of the city plans, but mainly these people were clerks and draftsmen. Robinson: Did you have to carry on the activities of this office with reduced forces? Baxter: With some reductions. It was comparatively easy to do because the office was over-staffed. It didn't make it any easier to take the responsibility to say this or that one would be fired or laid off, but the city was in a tough spot. I took that job at a reduction in salary down to $1300. It moved up again within a year or so. I took it because Norma and I had planned to be married in October of that year so the question was do we cancel the marriage? Do we go to live with our parents? Or if we're going to be married at least that much would pay for rent and food. Robinson: When you took the job at your young age, did the thought of operating an office by yourself intimidate you or cause you some anxiety? Baxter: I don't think it did. I hope I had some of the normal hope to progress and do something better and new. If I hadn't had it at the time I would have said no. But here was a chance to be moved from a district office. Incidentally, there were 10 district offices in Philadelphia doing the kind of work I was involved in. This was a chance to move downtown on the same floor as the chief engineer and to take charge of something. Looking back, the thought to do so was in me even if I didn't recognize it. Robinson: You mentioned that from your current perspective the job was rather easy. But did it offer any special challenges or problems that you had to deal with? Baxter: Making sure that some of the people got rid of their bad habits of coming in late. Getting them to do the work with the decreased amount of staff. Handling the tremendous amount of real estate transactions. Incorporating modern and organized methods to complete the work. In addition, this same office had the responsibility of being the repository for all the city plans prepared by a board called the Board of Surveyors. The job put me directory in contact with the planning agency for the whole city. Robinson: Who were the members of the board? Baxter: Members of the board were the people in charge of each of the district survey offices. In the 1930s, there were opportunities for planning because you weren't doing much else. If you go back through the yearbooks of APWA, you will find much on planning for after the Depression. Everybody was doing planning. Robinson: Were most of the people involved in the planning engineers? Robinson: That's not at all common today with respect to city planning. Robinson: How do you account from this change from engineers to an entirely different profession with a somewhat different outlook and training? Baxter: The engineers as a group, not as individuals, let themselves get involved in too many technical details. They did not look at the broad picture of what was needed for the city. Tom Buckley was an exception. If Buckley had a specialty in the public works and engineering field, it was city planning. Remember I'm talking about the 30s, 40s, and 50s when he was at his full activity. When it came to building a sewer, for example, he saw more than just the hydraulics, its design, diameter. He saw it as a public works function that was going to give service to people. I think those engineers left a vacuum, which was filled by people who came in as professional planners. Robinson: Did the city make any effort to derive alternative sources of revenue in light of the loss of income from real estate taxes? Baxter: Yes. There were two. First, the city established what is known as the wage tax. It's an income tax. Second, it charged sewer rents to support the sewer and sewage disposal system as distinct from pouring general revenues into it. The water rates had been collected separately even though in those early days they did not fully support the system. Philadelphia was one of the first larger cities that made a separate charge for sewer and sewage treatment services. This charge was not fully approved in the U.S. Supreme Court until after I came back from the war. Robinson: Was there a concern with some of the same issues we have now such as infrastructure decay and those sorts of problems that are associated with revenue shortfall? Baxter: First, nobody used the word infrastructure at that time. Compared to today the sewer and water lines were 50 years younger and weren't in such a state that anything was happening to them. Of more importance, the heavier trucks which are now on the highways didn't exist, and the structures were not damaged by these and oversized vehicles. Robinson: In your position as assistant city engineer and registrar were you given any other special assignments? Baxter: This was the time that Buckley was looking ahead at the city planning that was going to come along when the Depression ended. I was given all sorts of special studies to make, most of them local in one sense or another. One I do remember was in 1937 when the state first assumed responsibility for certain highways in the city. Again, I made a few suggestions from the preliminary plans and was told, Why don't you do it? So I was given the responsibility of making the state highway plans using their format (a format we never used for making city plans). Robinson: Did it involve working with state highway engineers? Baxter: Yes. I used my own draftsmen or got one or two engineering people transferred into my unit. Robinson: What was the funding format for the projects that involved both the municipal and state efforts? Baxter: In the early days, if work was done on a state highway within a city, the city would pay the cost of preparing the plans and the state would pay the contract costs. This was the reason why the city, having no other large unit directly assigned to make contract plans for state highways, had to use my unit. As the work became greater, the city then started to hire consulting engineers. Under today's program the state pays all of the work costs. Robinson: At this time who maintained the highways within the city boundaries? Baxter: The designation of certain streets as state highways also required the state to maintain them. But like many things, in the 1930s, there wasn't much maintenance. The problem now has gotten to the point that the city, in order to partly protect itself from citizens who complain about anything from potholes to poor maintenance on state highways, now has signs posted every quarter of a mile giving the local telephone number of the state highway department. Robinson: In addition to your work with highways, did you have any other special assignments during this period? Baxter: There were all sorts of special assignments. Buckley had a very fertile mind. Robinson: Do you feel this kind of work broadened you as an engineer? Baxter: Oh yes, tremendously, because it allowed me full rein to wander around not only other city agencies but to work with outside people. Robinson: In those days, did you have any direct contact or relationship with elected officials in the city? Baxter: I didn't have any direct contact with them, except maybe at a dinner meeting (and that would be casual) until 1940. Then I had almost daily contact with the mayor who was new, Robert Lamberton, and that had to do with WPA work. Robinson: Did the city ever undertake any PWA projects during this period? Baxter: To my recollection the city never built any PWA projects. The Public Works Department did use money to prepare plans for three new sewage treatment plants. After 1936 the city did get into WPA projects. The person assigned to have charge of all these projects was John Neeson. Robinson: What was his title? Baxter: He had the title of chief engineer and surveyor of the Public Works Department. Around 1938 this work (WPA) was taking up so much of his time that, as somewhat of a freewheeling division head, I was given the title of WPA coordinator, which meant that I was placed in charge of all WPA projects. Robinson: What kinds of projects were being undertaken when you took over? Baxter: Everything. In one case, in order to take care of the people in the clothing factories, we even made doll dresses. We built miscellaneous things, like highway ramps. We got into minor construction. I remember one project in particular because of what might be called its social effects. There were a great many engineers and architects out of work. The city had many records that were wearing out, just from use. One of the series of records was under my department. There were literally thousands of detailed maps of every lot in the city, complete with their dimensions, plus tens of thousands of pages showing the entire line of ownership from 1865. These things were kept up-to-date but they were used by the public. They would gradually get torn or smeared and needed replacement. We had one big project in which all those original records were recopied. Top-level architects and engineers, many of them way above my ability and experience, worked on the WPA project. There was no unemployment compensation at that time. If you didn't make money on a WPA project, you borrowed money from your friends, or you lived with your parents, or if you were lucky enough and you were older, you had a son you could live with. One of the things I tried to do as WPA coordinator was work that had some value, and even though it was heart-rending to see hundreds of such qualified people doing such menial work. Robinson: The WPA was often characterized as people leaning on shovels and rakes. You mentioned you tried to include projects that had value and merit. What were some of the public works-oriented projects that you oversaw? Baxter: There was work such as maintenance of streets and highways. In the summertime there were grass-cutting programs. There was work to be done in the parks. There was painting of structures that needed to be painted: bridges (particularly iron ones). We tried to do projects that had some overall value to the city. This was the time that I did get involved with elected officials, because the city had to put up a certain amount of money to match the WPA or put up a certain percentage of the project in kind. And that wasn't so easy when the city had no in-kind to put up. Robinson: How many people were working for you? Baxter: I can't remember exactly, but there were an awful lot of them. There was a certain amount of money to spend which brought me in direct contact with Mayor Lamberton. Just as Hoffman and Buckley had given me the opportunity to see people, John Neeson gave me the opportunity to see the mayor directly even though I was an assigned employee of his bureau. Since some of the projects involved the city council, I got to know some of the councilmen. Then there were people of all sorts in the city who were interested in having a WPA project done. These included civic organizations and political leaders. Robinson: In light of all this responsibility, who had the final decision as to what projects would be undertaken? Baxter: I think I probably did. Except WPA also assigned an engineer to look after its interests. At least from my experience, WPA in Philadelphia tried to live up to the federal legislation. Robinson: Did you have to be careful about making sure the projects were distributed geographically in the city? Baxter: It wasn't so much geographical because the impact of the projects wasn't very great. The point was that with the numbers of people out of work, as an example, you wouldn't dare let the construction people get the jobs while factory workers or others remained idle. Robinson: You had to be sensitive to the needs of the citizens in the community who were out of work? Baxter: Heavens, yes. Use the skills they possessed and to a certain extent spread the work around so that it could be seen in different places. Robinson: Did you often have to be involved in discussions with community groups and politicians that wanted certain projects undertaken? Baxter: Not so much with community groups and politicians at that time. There were discussions, I'm sure of that. But the main point was trying to get almost any kind of things going. There were enough ideas but not enough money or personnel to design them. Robinson: Were the largest percentage of the projects construction projects? Baxter: No. I would guess no more than maybe one-third of them. Robinson: In addition to the maintenance activities you mentioned and construction projects, what other kinds of endeavors did WPA undertake in the city. For example, did you get involved in art and theater as some other communities? Baxter: Yes. I remember being involved in some way with a small neighborhood art group. Robinson: Do you feel that the people working for you were able to take care of their economic circumstances and recover some of their self-esteem? Baxter: Yes. If the whole thing happened today, when a person can draw unemployment and other kind of compensation, some people would recover some of their self-esteem if they could get a minor job such as WPA. I also think that that are a number of people today who would rather stay on compensation and take welfare, rather than go out and work for the same amount of money or in some cases less. I guess we've gotten used to handouts of one form or another. Robinson: How long were you in this capacity as WPA coordinator? Baxter: I was in it, in one form or another, from roughly the beginning of 1939 until I went on active duty in the Army in the summer of 1942. Robinson: What percentage of your time did it take? Baxter: It took most of my time because while I still had some overall responsibility with the old Registry and Plans Division, there were other people carrying it on and I only had nominal responsibility. Robinson: What position did you hold after your involvement in these WPA activities? Baxter: The next position I had was a real jump for me at least in terms of titles. I became assistant director of public works. Now at that time the Public Works Department had bureaus under it--the Engineering and Surveys Bureau which covered sewers, it had the Water Bureau which covered water, it had the City Property Bureau which included city buildings, the Highway Bureau in charge of all the streets and highways. It had the sanitation bureau, which did all the refuse collection. It had the Mechanical Equipment Bureau, which maintained equipment for all city vehicles, and it ran the airport and also did the street lighting. The director of public works was actually the top banana and the assistant director was next. Robinson: What year did you take this position? Baxter: In the early part of 1940. Robinson: How do you account for someone of your relatively tender years being given such responsibility? Baxter: Again, it was somewhat being in the right place at the right time. The circumstances account for a great deal. John H. Neeson was at that time the director of public works. Buckley was the chief engineer of the Engineering and Surveys Bureau. Traditionally, for many years, the assistant director of public works had been a politician whose main duty was to look after the appointments of labor and such things as that. Neeson decided he did not want a politician and he brought in an engineer as assistant director. Unfortunately, this person got into a situation which made his position untenable. I was working for Neeson doing the WPA job he wanted plus some other things. But my WPA work had kept me in direct contact with the mayor so I was in a sense in the right place at the right time. Robinson: Had the overall organization of the Department of Public Works changed at all during the 1930s? Baxter: No. Our primary concern at this point was the amount of work and responsibility for studies Neeson would carryon in his office. The director of public works office was reasonably small. There was the director, a couple of secretaries, and a chief clerk. Neeson wanted a second person to whom he could assign jobs and ask to review things that the bureau chiefs were sending up for decisions. That's why he wanted an experienced engineer. And that's the kind of work I got from him. The Bureau of Mechanical Equipment, for example, was run at that time by a very likable Irishman, who had grown up from the ranks but knew nothing about administration or organization. He was also involved in politics. That bureau had to be completely reorganized and I was given the assignment. Robinson: Do you feel your experiences as a WPA administrator, as well as the other special assignments, gave you a versatility and overall view of the city's operations that perhaps others might not have had? Baxter: It did give me an overall view of the city's operations. I knew the chiefs of the bureaus from my involvement in public works because each of them had some kind of WPA operation even though they might not have paid too much attention to it. I had to deal with them to get a job started. It certainly made it easier that I knew them when I became assistant public works director. I probably knew some of them through my Philadelphia APWA Chapter work. But at least when I did get the position, I could walk in and they wouldn't say: Who is this young whippersnapper and how did he get here? They at least accepted me. Robinson: Had the economy of the city recovered to the point where it could once again think about undertaking large public works endeavors? Baxter: The economy had recovered but not enough to make them start thinking about large public works projects because the main emphasis was the war effort. Robinson: How did that influence decisions with respect to the public works projects? The city before the war started to build its second airport, the North Philadelphia Airport. And while I'm partly jumping a little ahead on this, I have to do it to answer the question. The Public Works Department negotiated with the district engineer of the Army Corps of Engineers to acquire a site in Philadelphia to build a field for interceptor airplanes. I was the principal negotiator with the district engineer to acquire this site. Incidentally, this North Philadelphia Airport was built as an interceptor site to fight off the German bombers that people at that time thought were able to come over and attack American cities. My first assignment, once to called active duty in the Army, was to build that airport. Robinson: Was there any incentive to consciously make the economy of the city recover? Baxter: I don't think so at that time. The war effort had put all sorts of people back to work. I'd have to go back to look at records to see what the balance sheet looked like for those years, but certainly during this time things were moving. Robinson: In 1940 and thereafter, was there an increase in the number of engineers in the public works department? Baxter: People were being brought back for whatever work there was. This was an interesting point, because I saw this after I came back from the Army. Normally an engineering department or public works department brings in young people. There are always newer people coming in, older people retiring, middle-aged ones moving up the ladder, etc. There were so many city people dropped in the 1930s due to the Depression. After the war we'd lost senior engineers, so we were out actively recruiting. After the war, we hired consultants when in previous years we would have used in-house staff. But it took the city a fairly long time to get younger men to come in and at least give them the opportunity to take responsibility on their own. Robinson: Because of your position immediately beneath Neeson on the organizational chart, did you have a perspective on the kinds of political pressures that were often exerted on the public works director? Robinson: Were there ever efforts by politicians to initiate public works projects in a particular part of the city, for example? Baxter: Oh, sure. That's perfectly proper in a sense. Most of the kind of things they would want done would be to widen a street, or build a new street in a new area of the city, or if we had a bridge that was posted for a load-limit, to get that bridge done. These were the kinds of things political leaders work on. And I see them as perfectly proper. In a perfect condition, I would like to think that the employees of a public works department (from the director on down) would be able, as an example, to schedule abridge for reconstruction when a load limit was placed on it, before any political leader would start to say: why don't you rebuild that bridge. But this perfect condition doesn't exist. I'd always hoped, especially when I had a department myself, that we would get to things that needed correction with our own forces before any kind of political pressure came along. Robinson: Would the political leader come to Neeson and ask him to make a request for an appropriation for a certain project, or would one try to approach somebody on council? Baxter: Well it happens both ways. In those years, and it went on through the years when I was department head with the title of commissioner in the water works department, the political people on the council, the political people who were the ward leaders, had a reasonably good opinion of the public works and engineering staffs of the city. Robinson: Would they at times defer to your judgment? Baxter: Yes. If they thought there was some project in their district that they would like done, they would come to the public works director or would come to the water commissioner and say: What do you think about this? In later years it was a little bit easier because the council passed a six-year budget so you could spread things out. Back in the days of Neeson I don't believe we had the six-year capital budget. Every year we would go to council with our budget. And during the two years that I was assistant director of public works we'd sit before the council and go down the budget line by line. I was the one that sat in the chair and took the beating from the council. I would argue like hell on some particular thing, then in the final wrap-up Neeson would come in and he would agree to some of the things I would say no to. I was only saying no because that was the arrangement. But the point was that in giving up some things, we got others at different times that we thought we couldn't get. Robinson: This may seem like a mundane question, but how were citizen complaints handled? Baxter: Hopefully not as good as later on. At least we started to handle them pretty well in the Water Department. Most of the departments did not have any specific arrangements to handle customer complaints or even customer requests. This easily led to the fact that a person could telephone in and get pushed around without anybody deliberately wanting to be discourteous. They would get somebody on the phone and by the time the guy would try to transfer them, you might get the wrong department or even lose the connection altogether. There is nothing more annoying, whether you're calling a city department or a department store, than that. Under the new charter, which went into effect in 1952, the mayor's office had to set up an office of information and complaints. Part of the mayor's own office theoretically can be called by every citizen. But that meant they would still have to transfer complaints back to the Water Department, etc. So I set up in the Water Department my own consumer office. The mayor's office was interested in showing the public that it was handling complaints. I was not interested in the mayor's office. I was interested in the Water Department and in handling its complaints first hand. We even had a special telephone number in the front of the telephone book. Citizens could call and would not be transferred. They talked to a customer service agent who would take the complaint or request and get them an answer. Robinson: When did you start getting involved in the military? Baxter: About 1937. At that time working in our sewage division was a man named Michael J. Blew together with another man, Bill Hardenberg, who many people in public works know -he was the publisher and editor of Public Works magazine for a long time. Both of these young men had been officers in what was known as the Sanitary Corps of the Medical Department of the Army in World War I. They served in France and kept that unit alive during the 1920s and 1930s and went on active duty for two weeks in the summertime. Mike and I knew one another in the public works department and it was somewhere around 1937 Mike said to me: Sam, we're gonna get into a war. You might as well get in it now. So I went into the reserves as a second lieutenant in 1937. And because even then the Army had restrictions as to the number of people they were taking, my reserve commission was in the Administrative Corps of the Medical Department. That's the outfit that runs hospitals for the Army. But I trained with the sanitary corps from 1937 on. They allowed me to do that. In 1941 the Army decided it was necessary to build airports around Philadelphia to protect the city against German bombers. These were to be for interceptors. One of these airports is now the North Philadelphia Airport. So that's how I started. The airport's still used primarily for private airplanes. Lot of freight and commuter lines stop there. Later on that year, I received a circular from the Army saying it was setting up a school at the University of Virginia to train Army officers in the military government occupation of captured countries, primarily Germany. I sent the application in. As a result of that application, I had a call to go down to Washington, D.C., to meet a certain Major Johnson in the Corps of Engineers' office. This man asked me how I'd like to work in Tennessee for the Corps of Engineers. It turned out that the Manhattan Project (Atom Bomb Project) was just getting started and they were intercepting any requests for transfers to fill a lot of positions. Robinson: Would this have been in 1942? Baxter: Yes. My experience caught their eye -assistant director of public works with a lot of planning experience in 1930s. This is where I was sent and of course. Again, it was sort of a combination of being in the right place at the right time, having my title of assistant director of public works, showing them that I had planning experience. The original plan was to build a town (Oak Ridge) for 10,000 civilians--it grew to be 75,000. We built it on a virgin hillside in Tennessee in a very short time under terrific pressure. Not only did I have the direct responsibility for supervising the design and construction but also the management of the town -bringing in the department store, the beauty shops, the churches, every other thing. Nobody has ever had an experience like that, except those who worked along with me. I was at that time the senior person for the Army. The architect-engineer firm was Skidmore, Owings, and Merrill. They made a reputation at the New York Worlds Fair but nothing like the reputation they have now in building the Sears Tower. Robinson: What was the relationship between you and the people in the architectural firm? Baxter: It was excellent. John Merrill was living at that time. He was a resident partner. Skidmore and Owings would come down about once a month. And I used to tell people that my main job was to get the two of them out of town immediately. Mainly because every one of them had ideas of their own on what should be done. The three of them coming in and debating while I was under instruction from the Army to have a 5,000-person unit ready by next Monday was a little hard to take. Bugher: How long did the job take? Baxter: It took about three years. Robinson: How big was the labor force? Baxter: It moved up and down. It varied. I don't know the numbers. Once we had gotten the first 10,000 units built there would be a staff meeting in which the Army would say to me: We need another 10,000-person unit. And we need it at such and time. We'd go right back to the office and order so many feet of pipe and so many feet of lumber to build the houses. We'd know immediately that for 10,000 people that would be roughly 3,000 houses so we'd then order 3,000 refrigerators, 3,000 heaters, etc. Leonard Orlando (vice president, Philadelphia Gas Works, who briefly assisted in the interview): When you plan a town like Oak Ridge for 10,000 units and you put in a water distribution system, and sewage system, and so on, how did you expand on these when you had to suddenly grow to 75,000? Baxter: You didn't ask questions. How do you win a war? You just do it. There was duplication and loss of efficiency but the work just had to be done. Bugher: Was the Manhattan Project just something that was conducted at Oak Ridge or was it done elsewhere? Baxter: No. It was conducted in many places. One of the larger units was at Hanford, Washington, which was the place the Dupont Company had the main operation. Where they made the plutonium. The other large operation was in the Los Alamos area in New Mexico. This was the place where they put the bomb together and triggered the first one. Bugher: When they conceived the project, why did they go to Oak Ridge? Baxter: I think the reason was they needed a source of electricity. And it was remote. If I told you all of the amusing stories connected with this we could use all of Mike's tapes. Baxter: Believe it or not, on the Clinch River, which was the river from which we took the water and discharged the sewage treatment plant, the sewage treatment plant was upriver from the water intake point. There was nothing basically wrong with that if you look at it from design--it just looked wrong. That particular design had been done by Stone and Webster before I got involved in the project. And it was done as a separate unit. The kind of people who came into town were all educated people. Physicists, scientists of all sorts, etc. And they all had questions to ask. I still remember taking some of them down to the sewage plant to show them that it was perfectly sound. Bugher: You had a lot more to do there than simply building the city. Who did you report to and how broad of an authority did you have? Baxter: It was all part of building a new town. I reported to the man who was then a colonel named Nichols. Robinson: Was he the manager for the Manhattan District or just that part of the project? Bugher: Now that sounds like practical instruction. How much time did they give you? Baxter: I don't remember the times involved but all of them had a practically impossible time schedule to meet. And they kept adding on to it. Robinson: Did any of the Army top brass show up at the town? Baxter: The man in charge of the whole Manhattan Project was General Leslie Groves. Groves would come down about once a month. We were all compartmentalized. He would go around with his secretary and anything he saw that he didn't like he'd dictate to his secretary right while I was standing there. He was always trying to make sure you didn't do more than what you had to and that you didn't do anything fancy. He found some fault with the nice planning and layout we were doing, but this didn't cost us much. I can remember the day he walked into the high school when it was finished, said something nasty, turned on his heel, and walked out. I also got into an argument with him about the tennis courts I'd built. He and I were both tennis players and I forget what the disagreement was about. Robinson: Did he come to the site very often? Baxter: At least once a month. One point to remember is that Groves was under a tremendous amount of pressure. He had more pressure and greater stress than anybody else. He knew that the Germans were also working on some kind of a nuclear project. So with that pressure--in addition to the pressure from people in Congress saying: You're wasting money on the war effort--he certainly had his work to do. I didn't appreciate that until after the war was over. Bugher: Did you know, when you were there, anything about the project? Baxter: Only slightly. I would like to talk about the town plan. Every one of the streets had little cul-de-sacs going around them, which the houses were built on. The main street was Tennessee Avenue. The first street going up the hill was I think Florida. Then there was Georgia. The streets went up alphabetically. On Florida for example, all the cul-de-sacs that went off were all streets beginning with the letter F. Everyone of these street names was picked out of Boyd's Directory of street names for Philadelphia. Bugher: Have you been back to Oak Ridge? Baxter: Once. I went back maybe 15 years ago to speak at the dedication of a new Knoxville water plant. While I was there the man in charge of the new water plant along with others had arranged for me to go to Oak Ridge, look around, and visit with the mayor. They had a dinner for me in what was the old guest house. Among other things that I did down there, I built a hospital. The chief of medical services for the project was Stafford Warren. He was brought in there as a reserve colonel. At that time he was the head of the radiology at a hospital in Rochester, New York. I got to know him well and he was very thankful that I had built this hospital. Incidentally, this hospital was run by Army reserve doctors from St. Paul, Minnesota. That's the way the reserves were run, as a field hospital of some sort. So the whole outfit moved down there. We built with a minor amount of complaints a hospital Warren thought was wonderful. So just about the time I finished Oak Ridge, Warren had a research project going on up at Rochester, New York, on the effects of uranium on human beings -from the time they would mine it to when they would transport it, down to the point of what they did with it to make the bomb. While that 400-unit facility was primarily for civilians, there were about 10 medical and engineering officers there and about 25 enlisted men. None of the enlisted men had a rank lower than sergeant. By that time, the Army had run into problems because they were commissioning too many civilians. So the Army got around this by getting these people drafted as they graduated and sent to boot camp for four weeks. Then they would send them up here to me or some other place. These people could have cared less about Army regulations. Anyhow, this unit up here wasn't getting the results that Warren wanted. So I spent the last year of the war in Rochester. I was sent there to get the scientists going rather than have them doing work on interesting research that had nothing to do with the project. Robinson: Were you successful in imposing some discipline on those scientists? Baxter: I think so. We used monkeys, and of course we were supposed to be a secret project. People knew we were there but they had no idea at all about what we were doing. We had 12-15 monkeys, which were being exposed to radiation under different conditions and amounts of time. The day I arrived one of the monkeys escaped and got in the park. That landed in the newspapers. Rumors started flying saying if the monkey bit you, you'd die right away. The phones started ringing. We finally caught the monkey with a crate with an orange in it. The real point was that I couldn't tell anybody why we had to get him back. Any of the other monkeys we could have shot and it wouldn't have mattered. They were all in different stages of experiment. This guy was the control monkey -he had never been exposed! Orlando: Sam, I was interested in your comment about how these hospitals were manned by reserve units from a hospital. I don't know whether you knew it or not but the University of Pennsylvania manned a hospital in India? Baxter: Oh, sure. That's how they were organized. If possible they try to get them all from the same local hospital. This is similar to the way the Corps of Engineers will train and get together units for active duty. Robinson: What happened once you got out of the Army? Baxter: I got out of the Army right at the end of 1945. John Neeson had died in the late fall of 1945. The man who became director was Martin McLaughlin. He had been chief of the Water Bureau at one time in Philadelphia. McLaughlin was primarily an electrical engineer graduate from Villanova University. We all came back to the same jobs we had if they were there. I came back as assistant director, but McLaughlin did not want an assistant. He wanted the bureau chiefs to do all the work. He only wanted to do a minimum amount of overseeing. He had been a bureau chief himself and thought they could handle it. Baxter: He didn't say in so many words: Get out of here, I don't want an assistant. I knew he didn't. He wouldn't have somebody come back from the war and tell them they couldn't have their old job back. The city was facing two big projects. The first was three new sewage plants, for which the plans had been partially prepared under PWA contracts before the war. The other project was building a new airport terminal. So after some consultation I decided to go back to the Bureau of Engineering and Surveys, which Tom Buckley was the chief of at the time. I was given the title of projects engineer, which involved getting the sewage plants built and the airport going. In a very short time, McLaughlin died. John Allen who had the title of principal or chief engineer, and Fred Thorpe who was at one time president of the Philadelphia chapter, had the title of assistant chief engineer and surveyor. Well, with the switching around after McLaughlin died, Buckley moved into the directorship. Hoffman who was over here moved into the chief engineers' spot. I (going in as project engineer) had the title of chief engineer, which meant I headed the engineering for that bureau and Thorpe headed the survey end of it. Robinson: So this is in the Bureau of Engineers? Baxter: That's right. The Bureau of Engineering and Surveys. Robinson: In light of the fact that you'd gone through a decade of depression along with another five years of war, was there a sense after the war that you had a huge backlog of projects that needed to be built? Baxter: There were a whole lot of things that had to be done. And that's exactly what happened. The street lighting was one. The city only had one little sewage plant built 50 years prior. I held the title of chief engineer through 1949. We got the first sewage plant built at Northeast before the charter change, which occurred in January 1952. The other two sewage plants were finished in the 1950s under the new charter. We also got started on the construction of the airport. The effort was guided primarily by Tom Buckley and a citizen on the Chamber of Commerce named Walter Miller. I commuted regularly between the FAA office in Harrisburg and the FAA office in Washington trying to deal with the administrative details of that project. Starting the new airport included extending a runway, building a new administration building, and a new ramp. We started to build on the day the conflict began in Korea. This immediately changed the plans. Anything that had stainless steel had to come out and we had to redesign. I worked on the airport that was the assignment from 1946 to 1951. Robinson: You handled design all the way through construction? Baxter: Design, construction, and ultimately operation. We also had grants for the sewage treatment plants. These grants were for 30 percent of the cost not to exceed $250,000. The first contract we had was for $25 million and so all we got was a measly $250,000. You didn't get anywhere near the 30 percent unless you were a small town. All of the councilmen, the mayor, and citizens said we had to get all the federal grants we could. They didn't understand that we were losing more than $250,000 just by following federal rules and awaiting federal decisions. Robinson: During this period, when there was a great deal of construction going on, was there a lot of competition among the various bureaus for funds? Baxter: We did not run into that with the jobs I had so much for this reason. You'll recall that I told you that Philadelphia was one of the first cities (and probably the first large city) that had enacted sewer rents. In order to get this program going (even prior to World War I) the city needed borrowing capacity to sell its bonds. There was a legislative limit, which the city had reached. Bugher: For general obligation bonds? Baxter: For general obligation bonds. That's exactly the point, Bob. Since these rents were for a new type of revenue bond that money didn't have to come within the debt limit of the city. The whole thing was challenged in the court. But finally the ordinance was approved all the way to the United States Supreme Court--the court refusing to take jurisdiction from the Pennsylvania Supreme Court, which had approved it. Robinson: You used those funds to build your treatment plants? Baxter: Yes we did. We used the capital funds to support the sewer system. Those funds still provide the 25 percent the city spends on new treatment work. The airport did get some money from the federal government, but not very much. By that time, the old airport was in such poor condition that everybody was for it. The Chamber of Commerce got behind it, and we received some federal grants. Meanwhile we had this Northeast Airport built. We had a councilman, who was chairman of the finance committee from the northeastern part of the city, who wanted an even split between the two airports. Philadelphia needed a main airport. It didn't need two half-baked airports. Tom Buckley and I had a real battle in the council and we finally settled it by making do. We gave the councilman $1 million for the old Philadelphia airport -most of which went for an access road to get to the airport. The other $9 million then went to the new facility. When the new Water Department was created water and sewer were placed under one department with self-sustaining water rents to support the projects. From that time on I didn't have any competition with anybody else. The only competition would be that occasionally somebody would try to take some of our money. Robinson: Just as a matter of clarification, after you designed and built the project under the Bureau of Engineering and Surveys was it then turned over to some other bureau. Baxter: No. The Bureau of Engineering operated the sewage plants. Robinson: Was there a separate water department at this time? Baxter: No, there was a separate Bureau of Water. Robinson: Within the Public Works Department? Bugher: Regarding the storm drains, do the developers build these now or does the city? Baxter: The city builds them for the developers, actually contracts them. The owners pay a front foot assessment charge which, when it was originally fixed some years ago, was approximately the cost. It evened out since it was on a front foot basis. But ever since I left the city about 10 years ago, they haven't adjusted the front foot rates so the city is now paying a larger amount of the cost. Robinson: When was the Walnut Lane Project Launched? Baxter: It was actually launched about 1949, but it had developed for a couple of years before that. The background on that is this. Walnut Lane crosses a main valley in Fairmount Park. Back in the early days of this century a very famous concrete arch bridge had been built on Walnut Lane. You'll find it written in all the transactions of ASCE and others because it was quite a bridge in its day. It's well known today, by the way, as a place where people who want to commit suicide jump off. But further east there was an old bridge, which, right after the World War, had gotten in such condition that traffic was banned. The bridge was closed to everything except pedestrians. The Bureau of Engineering and Surveys traditionally had the responsibility for designing and building bridges in Philadelphia. It did not build the big suspension bridges over the Delaware. But it built the bridges throughout the city involving grade crossings and ones like the earlier Walnut Lane Bridge. During 1947-1949 we designed a concrete arch bridge over this small valley. We thought it was a nice design. It was. But the Art Commission, which had approval of the esthetics of the bridge, said it was too large and inappropriate for a concrete bridge to be placed in a park setting. Robinson: In other words, the bridge was being built within the boundaries of a park so this Art Commission had authority to approve its design. Baxter: Yes. But just from the standpoint of esthetics. In fact, they'd have the same approval even if it wasn't in the park but this gave their approval more weight then they turned it down. Robinson: In other words, their authority was citywide? Baxter: Yes. In fact there still is such a citywide commission. Robinson: When was it created, do you know? Baxter: It was created at least as far back as the 1920s and in the new charter of 1952 it was reconstituted. Any public building using public funds must have the approval of the art jury/commission. So much depends upon the people who are on that commission. There are some good, sensible people, some architects, some engineers, but an occasional opinionated person could make things difficult. Robinson: Were the members appointed by the mayor? Baxter: Yes. Then it was suggested to us that one way to make this bridge more attractive would be to put a granite face on the side of this concrete bridge. We tried to design it that way. But adding that load to the bridge required structural changes and the extra cost went beyond available funds. These were the years when we were building the new sewage treatment plants. These plants had large tanks for sludge digestion. An option at that time was to build a circular tank using prestressed concrete. In those tanks, you wrapped the fine wires around that concrete and using a gun-Like method you sprayed the outside on. We were building concrete tanks of that sort and the pre-stressed technique was familiar to us. At various staff meetings we discussed applying pre-stressing to bridges. In the U.S. at that time there wasn't any such practice. But in Europe there was, particularly in Belgium and France. A man named Magnel in Belgium, and a man named Freysinnet in France had been building them for years. They had started to build pre-stressed bridges because steel was expensive over there. Over here labor was expensive and steel was comparatively expensive. We got in contact with the people in Europe, particularly Magnel. With one of his students named Charles Zollman (who by that time was here and working on the pre-stressed sewage tanks) we worked out a preliminary prestressed design for Walnut Lane Bridge. In 1949 Zollman, myself, and Edwin Scofield, who was the chief of the design division in the Bureau of Engineering and Surveys, one or two others, and I think one contractor, spent a few weeks in Belgium and France looking over what Freysinnet and Magnel were doing. We weren't quite sure of what we wanted to do. Robinson: Was this the common practice to send engineers abroad to view structures? Baxter: It was in the Engineering and Surveys Bureau because when the city designed a basic sewage treatment plant in 1915 the engineers of that day actually spent two summers in Germany where sewage treatment was more advanced than any other part of the world. They also went to England, and their report of those years around 1915 shows that they went to see what other people were doing. At the present time, some of the European engineers come here, but in those days we went over there--for sewage treatment in the beginning, then, for prestressed concrete. It was decided to go ahead. The whole theory of the bridge is that, since concrete has a lot of strength in compression but none in tension, you placed the bottom of the concrete in tension by putting fine wires into it and really pulling the concrete together. That's a layman's description. The design of the Walnut Lane Bridge was a team effort. Magnel himself came over, Zollman participated, and our own design group participated. At that time, I was the chief engineer. Sure, I participated. My main participation was in the fact that my name went on the plan and I was the one who held the bag if this new project didn't work. Then to be sure we knew what we were doing, the design was made, and the work was put out on contract. There were seven girders in the bridge (160 ft. long. But we hired a contractor both on the site and off the site to build a full-scale girder (before we built the seven main girders) and test it to destruction. The day we tested it we had a little grandstand right there with people from all over the country and some foreigners. We had a steel plant nearby and we borrowed iron ingots so the weight would be put on. We tested all day long and by the time it got dark we still hadn't broken the girder. We were just so conservative and had over-designed the darned thing. The next day we finally loaded it up and broke it. That bridge received a lot of publicity at the time. Nobody built one as long until 10 years later. Today pre-stressed buildings and bridges are common, but we were definitely the pioneers in the United States. Robinson: Did this project receive thorough press coverage? Baxter: Yes it did. We made sure it got coverage. I gave a basic paper on what was done up at MIT afterwards. Bugher: Do you think we could probably get a story from Engineering News-Record about that? Baxter: Well Engineering News-Record probably has it. There are all sorts of publications on it. Robinson: When was the bridge actually completed? Baxter: Thirty years ago to the day. And it was a day like today; we thought it was going to rain. Bugher: How far is it from here? Baxter: Twenty-five minutes by car. Bugher: That seems significant in the sense that it helps to demonstrate that a person in a position such as yours was so innovative in trying to adapt technical knowledge. And I guess what gave you the incentive was the shortfall on the funding? Baxter: That's right. I had to find something. We talked about plaques last night at dinner. Normally when you dedicate something it only has one plaque. But that bridge has two at either side of it. The reason is at that time it was a boundary between two wards in the city and each ward wanted credit for getting the funding for the bridge (the ward leaders that is). So one plaque says the 21st ward and the other says the 22nd. Tom Buckley was the director while we worked on the bridge. He supported all that we were doing. He did not participate in the details of it. This was the time when the Public Works Department as such disappeared due to the new 1952 charter. Robinson: The city received a new charter in 1952. Baxter: Yes. Though, it was written in 1951. There were many reasons for this and one of them was one that I had differences with Tom Buckley. Tom Buckley was the director and he had bureaus involving water, sewage, highways, street cleaning, airports, lighting, mechanical equipment, and others. As the charter writers began their work, he made the point that that conglomeration was too much for one man. He had been director of public works for about six years. I did not agree with him on that point except he was the guy sitting in that job and I wasn't. It's almost like saying we shouldn't have the United States of America because the presidency is too much for one man. So much depends on how you delegate and work things out. So that was one reason that it was split up. A second reason was that the writers of charter (and I supported them completely) wanted to pull out the water and sewer departments to make them a completely self-sustaining facility with separate funds and ratemaking powers vested in the water commission. Robinson: So in effect some of the separate bureaus were turned into departments, or bureaus were combined to create individual departments? Robinson: Now at this time you had a major change in your career when this new reorganization took place. What was your new assignment? Baxter: I was assigned as commissioner of this newly created Water Department with the responsibility for all things affecting water, sewage, stormwater, sewage treatment, and waste treatment. The department was required to be self-sustaining. There was a very unusual provision that the rates to make it self-sustaining were established by the commissioner, not by the city council or any other authority. Bugher: Was the charter adopted by a vote of the people? Bugher: Then the question of whether or not to have a separate department for water was in this charter? Baxter: Oh, that's in charter, that's correct. Bugher: Can that only be changed by a vote of people? Baxter: Well it can be changed by a vote of the people. There is, however, another alternate method in which the council can do something. But right now I forget the details. The reaction in Philadelphia as the charter was being written over two or three years was that the administration had been perhaps too conservative. The Republican Party had controlled the government for years. There were changes coming along. There were Democrats in Washington and the Democratic Party became the sponsor of the charter. One of the men involved with the charter, although not in writing it directly, was named Buck Sawyer. He became the managing director under the new charter. Bugher: What did he do before that? Baxter: He'd been working for the Bureau of Municipal Research or for another private unit such as that. He was a civil engineer and I got to know him very well. As I remember, he was the one who appointed me water commissioner. He said publicly to the people writing the charter, You'd better write a good one because I (we, his organization) have already sold the people on the idea that Philadelphia needed a new charter. His point was that whatever type of charter you write we've got the people in a mood to vote for it, no matter what the provisions. Bugher: How did you get the power to set rates? That's unusual, isn't it? Baxter: It's unusual and I don't know of any other large city with this practice. Bugher: Who was instrumental in this? Baxter: I was involved in this. But there were other people who sought to make the water and utilities supported by water rates. They saw that as long as the city council fixed the rates they were under pressure to keep them down and that appropriations would be insufficient to support proper maintenance. During the war years, the water utility rate had not been kept up-to-date. The very fine plants built at the beginning of the century had not been kept up. They had deteriorated, mainly because of lack of money. One of the little anecdotes that I sometimes use is this. One of the water bureau chiefs, somewhere around 1920, was a well-known engineer who said, The members of the council ought to be hung up by their thumbs until they appropriate enough money to maintain and operate the water works. Although that situation took place in the 1920s (about 20 years after these fine plants had been initially installed) it's also a common problem in the 1980s. The justification for giving the commission the power was this. The appropriation budget approval was in the hands of the council. All that the water commissioner did in fixing rates was to take that amount of money that the council said should be spent on the water works and fix rates that brought that amount of money in. He was an administrative officer responsible for bringing in an adequate amount. In Philadelphia, as in other places right now, there's a lot of discussion going on as to whether we should use water and sewer rates as a social procedure. Should we give the elderly and the poor a special rate? Is that equitable? They argue for ascending rates for big businesses on the theory that they have a lot of money and ought to pay more. I disagree with this completely. I think if we're going to subsidize senior citizens or the poor it should be through general taxation. Bugher: What is your feeling for industry? If you use more should they pay more? Baxter: No. I still believe in the descending rate. For example, let's say an industry uses the same amount of water as 500 houses. There are 500 meters in those 500 houses which have to be read, the bills have to be sent out and bills have to be collected. The industry only has the one meter, one bill (maybe only a quarterly bill or semi-annual bill at that). Also the industry itself pays promptly in most cases. Bugher: That's purely from an economic point of view. What is your feeling on water conservation or not using a great deal of water when it's in short supply? Baxter: I have expressed many times my views on this subject. I believe that if we need water it's up to us engineers and public works officials to obtain the supply. I realize that in parts of this country water is scarce. But I also know of other places where it isn't. It is my view to give people all the water they want as long as it comes through a meter and there is a rate schedule. Then the price of that water itself will determine how much water people use. There is at least one water utility in the country I know of that actually penalizes people using more than they think is a standard, and it helps those who don't use up to standard amounts. I don't believe in this. Robinson: You were appointed by a Democratic mayor? Robinson: How do you account for that in light of your Republican registration? Baxter: Well, Sawyer made the recommendation but by charter the actual appointment comes from the mayor. It was definite approval. I think there's a long background on that, Mike. This public works department and particularly the engineering bureau in it had a long reputation (even before my time) of being a professional group which worked in a political arena (it had to in the city). But the people did their job well and were recognized for their efforts. Robinson: Did you seek the position of commissioner? Baxter: No, I didn't seek it at any point, by asking for it. I guess that since I had a chance to comment on the charter because by the time it was being written I was the acting chief engineer. I was at least reasonably well known. I was known to Sawyer. Bugher: Why did Buckley leave? Baxter: He was of retirement age at that time and he didn't want it any longer. Or it may be that in the fields of water and sewage I was a little better known. Bugher: You mentioned Sawyer had a lot of influence. Was he from this area? Baxter: Only for a short time. He originally came from Michigan. Robinson: What were some of the major challenges you faced in development of your own department as commissioner? Baxter: First of all, we still had two of the sewage plants to build. We also had the whole series of water treatment plants to design and construct for the city. There were four of them. We only built three of them and abandoned one very small one. In the Water Department, rate-making became very important. We had to battle with people who wanted to take the rate-making decision away from the water commissioner. Another important item was metering in the city. Philadelphia had started to require metering as far back as 1917 or 1918. Still, about one-third of the older properties in the city had never been metered. We started a universal metering program, which we completed after a couple of court challenges. By 1960 we had every property in Philadelphia metered. Robinson: In light of the fact that there had been considerable neglect of existing facilities, and the fact that you had to build some newer facilities, was it necessary to raise rates dramatically? Baxter: It was. But to say that they were raised dramatically would be a little bit of an exaggeration. I discovered that there was a point you shouldn't exceed, both in time and amount, as you raised rates. The public would go so far. Roughly it was not make the changes any more frequently than every three or four years and keep increases less than 20 percent. I learned this very quickly. And I also talked to people to see how far they would go. So in my time as commissioner the rates were only changed about every four years and never more than 25 percent. Bugher: You mentioned that currently the figures are that rates are adjusted about every two years with up to 40 percent increases. What is your view of that? Baxter: I was talking about the period from 1952-1972. We did have to build new water treatment plants, borrow money and, of course, put the carrying charges onto the rates. The normal inflation rate was perhaps 3 or 4 percent in wages, materials, and supplies. And in a period when we were able to fix our own pace as to how we modernized and brought the system up to date, there were times when we deliberately postponed something so that we would stay within those rates. Then the Clean Water Act came along in 1972, which required each city to completely upgrade its sewage treatment plants, with tremendous amounts of federal money but also a 25 percent city share. Later, on the water side, came the Safe Drinking Water Act with all of its requirements. Coupled with that has been the high inflation rate which yearly kicks up operating costs, chemicals, labor, etc. So the present management of the water department has a situation entirely different than 1952-1972. A lot of these increases have been forced on the Water Department by these federal requirements, and by the city's willingness to do it. Bugher: The interest rates on money are another item. Baxter: Yes. That's another cost which is part of inflation. I remember talking to an EPA representative a few weeks before I left the department, when I saw some of the regulations that were being promulgated as a result of the Clean Water Act. And I said, You're out of your mind. I was then a lame duck as far as that was concerned. But I had testified against some of the provisions of the 1972 Clean Water Act. I have written continually during the last decade that the requirements were too much, too soon. They are part of the cause for the public debt increase and high interest rates. We have tried to do too much in the environmental field (of which water and sewers is one. I also think we've done too much in the social field. I don't care whether it's EEO or OSHA. These are just examples of where we can't match our financial ability with what we're required to do. I'm not the originator of the following thought but I do agree with it. Every time a city government enacts a new law that requires more spending it should require that it also enact a law that fixes the taxation or the service charge to pay for it. It would have a very fine effect on Congress and others who rush in and pass laws like the Clean Water Act and put absolutely impossible requirements in the act. How could we put ourselves in such a position? I blame all of us because we elected congressmen who were pressured into doing that by a comparatively small group. Robinson: When you were a commissioner and had to raise rates periodically what would you do to convince council and the public that the increased rates you were asking for were justified? Baxter: Within a week after the new rates went into effect, I had a staff meeting in which we would start to justify the next new rate. We started right then at the beginning of the next four-year period. We'd make announcements advertising that such and such a plant was going to be modernized. We'd show how much more efficient it would be in for example, getting better water out of it. We'd show, as an example, that we had a definite program of relining or replacing old water mains, which were supplying dirty water. We'd talk about these things anyplace people would let us talk. If we dedicated a new plant, for example, we'd have it covered in the newspaper. If a civic organization wanted a speaker, as much as possible I'd go, even if it were a 25-member Lions Club. But we also used groups. We enlisted the aid of the Chamber of Commerce. We would also have at least some people testifying in support of the increase. Under the charter, before a new rate increase is made, anyone can ask the commissioner for a hearing to give their viewpoints. We'd arrange for people to come in and testify in favor, which in these days is something almost unheard of. Bugher: This activity of the kind you describe is rather unusual in terms of the public works people in similar jobs around the country. Does it stem back to the provision in your charter giving the water commissioner the responsibility for establishing the rate? You've almost taken the establishment of rates for water and wastewater out of the political arena in terms of the professional staff. On the other hand, I'm sure there's political reaction to that, on the part of the council and others. That's kind of an unusual situation, isn't it? Baxter: Oh, it is. And in no way would lever want to say that we never had objection and that we never had people in the councilor political field who would want to object to rates. But it was very infrequently that we made a change in the announced rates after hearings. Bugher: It seems to me, though that your experience in this area is exactly what we're on the threshold of now when we have revenue shortfall problems in our water and sewer systems. And yet it's the political impediments that are making it difficult to get the necessary funding. Back in the 1950s you took some steps that removed, at least to some extent, a lot of pressures that other cities have to deal with. Baxter: Well we tried to do it during those 20 years. And I'm the first to recognize that conditions today are different from then. But we faced certain conditions, also. We faced rates that prior to 1952 didn't pay the costs of operating the water system. The result was a water system that was looked down upon by the people. Philadelphia water was called chlorine cocktails. The ships that used to come in to the naval base would have their brass work tarnish just from the gases coming off the river. Hydrogen sulfide was very common because there was so much sludge at the bottom of the river. Bugher: Did you have that universal metering program at that time? Bugher: Well that shows a sensitivity to conserving resources. Baxter: Well, first of all, you could get into some real discussions as to whether metering actually saves water or conserves water use. I tried to justify it in Philadelphia. I did find in some places where water would be reduced. But it was not done in order to conserve water. It was done to get the system on an equitable basis in which everybody was paying for the amount of water they used. At that time, I didn't care if those same people were using the same amount of water with a meter or not, as long as they paid for it. Bugher: It seems if you had long range planning so you could project 20 to 50 years in the future and you knew what the costs would be then in obtaining the large capacity, and you put the figures down to show what the projected increase in cost was going to be then I think you might come to the conclusion that consumption should be restricted. In other words, maybe you'd allow a higher rate earlier to discourage the usage so that in the future years 50 years hence it wouldn't necessitate a higher amount at that time. Baxter: This is where you get into a philosophical discussion. Should a water utility (in some cases it would be a private water utility) say to people that we're going to be the judges of how much water you should have? Water is a commodity. I see no reason to judge how many steaks are going to be available in the supermarket. We let the free market, within certain reasonable controls, judge the demand and put a price on it. If the price is too high, people won't buy the amount that's produced. Some would argue that water is different than food but it's one resource that is at least replenishable every year. We have some idea of what the finite amount of water is, but I don't think we've reached that in many parts of the country. Robinson: Sam, we hear much these days about the large amount of backlog of replacement and repair work that is needed to put public works on a sound footing. Did you face similar challenges in the water department at this time? Baxter: Certainly. The treatment plants had been allowed to run down because of lack of maintenance; there had been little or no work done on distribution systems or on the sewer collection systems or for that matter, on the sewers themselves. So there was a real backlog of work since nothing had been done except straight emergencies since the 1930s. We realized this and set out on a program. I'll use the water distribution system as an example. We set up a program of justifying which mains should either be replaced or which could be improved by cleaning and lining. Bugher: Was this cranked into the capital improvement program? Baxter: Yes. Because a new main was obviously a capital improvement and taking an old cast iron main that was lined (with cement lining) and cleaning the crud out of it was enough to improve in many cases the capacity of that main by 50 percent. We started in right away setting up criteria so we could judge which ones should be done first. One judgment that many would understand would be that say, for example, in a particular block or two blocks there were far more breaks in the main than in others. Another reason was the flow in the main. If it wasn't enough to run through the fire flow (and cities, by the way, are checked by insurance companies on fire flows), generally you could line it and improve it. If there were some structural problems, generally we'd go down and take a section out of the main--just a foot long. We'd analyze it because these old mains would carbonize and get to be brittle. Most of the old mains in the city were primarily cast iron. There are bills in Congress to have the government actually give grants to do this same thing with the distribution system. I can tell you I'm opposed to it. I believe it's something the city should do. I'm justifying my feeling on it by saying that water certainly has a higher priority than a lot of other things that the city spent its money on at the time. Since water is so important, nobody has the right to say that they can't afford it. Robinson: During the period that you were commissioner, do you feel that the Water Department and public works generally did in fact have a higher priority than perhaps they do now? Baxter: I can only speak from my own experience. Maybe we had almost hit rock bottom on some of these things in Philadelphia. Each year as I went back to the council for both the six-year capital program and the current-year appropriations or bond issues and current appropriations for operations, I never had any real problems. There were at times minor changes made, but I was able to sell them on the programs that we set. One important factor was that we had a council that understood what we were talking about. And they also recognized that we knew what we were doing. Bugher: Did council approve bond issues? Baxter: No. Except that the rates paid for the interest and amortization of the bonds. Generally there were some small things that were involved, yes. There was no substantial amount of rates set to actually do capital work. Bugher: What recourse did the public have if it didn't like the rate structure that was established? Baxter: They have the same recourse as they have with an investor-owned utility. With an investor-owned utility in Pennsylvania they appeal to the Public Utility Commission. This is common in almost any state where there's an investor-owned utility. In Pennsylvania and Philadelphia there are recourses to the courts, not only on rates a couple of times, but also universal metering. Robinson: What were some of the joint activities you would have with other city departments? Were there instances of parallel concerns and interaction and the need for coordination? Robinson: Did you serve as an arbiter in some of their disputes? Baxter: No. I didn't want to get involved. That was the job of the managing director and his assistant. But we did work out all sorts of arrangements with the other departments. Whenever it was possible to use another department for any of our work (repaving over repair ditches for an illustration) we would use the Streets Department and pay them out of our revenues. Whenever we did anything for them where we had a specific ability to do it (such as the use of our computer) we'd charge them. It would be a bookkeeping charge but would show the exact cost of running our department. Bugher: There is a lot of talk about maintenance of the infrastructure in the older cities. Do you feel that in Philadelphia, at least the water and sewer facilities are in better condition than most older cities because of the programs initiated back in those years? Or do you think they're suffering from the same problems as a lot of older cities? And if so, how do you propose dealing with that? Baxter: For the last 10 years I haven't been close to the Water Department although I still live in Philadelphia. But I think that the things we did during the 20 years under the new charter still have a definite effect and that the water and sewer utility is in reasonably good shape. It's been overwhelmed by these new federal laws requiring different things. Philadelphia has approximately 3,000 miles of water lines and 3,000 miles of sewers. When you have that much built underground as far back as the latter part of the last century or earlier, you're bound to have work going on all the time. Bugher: I think my question mostly related to the collection system. Do you feel that there is a continuing sort of replacement program so that 20,30,50 years hence a certain percentage of the present system would presumably be replaced? Is that the way the capital improvement programs work? Baxter: That's the way the overall program works. I can't talk about what the program is in Philadelphia at this time. I know just from driving around that I see mains being replaced but I don't know if it's being done at the same pace as it was in earlier years. Robinson: Are there any other areas you think we should explore in your career as water commissioner? Baxter: Nothing specific. We spent a fair amount of time in the department as time went on in working on management procedures. Whatever management techniques were being used had just come along. Certainly we all had a chance to reorganize our departments as far as setting up different bureaus or provisions in them when the new charter came along but we still had done nothing about trying to use real modern management techniques. In the 1960s, the Water Department decided to bring in an outstanding industrial management firm to make studies and recommendations. We brought them in due to some outside circumstances. They came in and said if we'd use their techniques we could reduce our field force by 20 percent and still do the job. My reaction to them at that time was that I thought I was running a reasonably good department. They came back to me and said, Yes you are, even pointing out [that] some of our procedures were as good as the privately owned utilities. We hired them and their first assignment was doing the time measurements of practically everything we were doing in the field. The number of men involved in that particular thing was about 300. After all measurements were done and after recommendations were made (these were field crews), we worked on it and finally did cut the manpower down by 20 percent. It was a savings. Bugher: These employees that you reduced by 20 percent, were they union employees? Baxter: They were unionized employees. Philadelphia has a strong union, the American Federation of State, County, and Municipal Workers. That union was very strong in later years, particularly to the overall city administration and to the political leaders. Early on we talked to our own business agent for the Water Department and told him what we were going to do. He wasn't happy that one of the results we planned was the elimination of people. We said that somewhere along the line we would either be able to retire or that in some way we would try to find jobs for them. That was as far as we would go. We didn't layoff the entire 20 percent at one time. That would have been impossible. We'd cut out a crew here and there. We'd try to find a particular person in a crew that could retire. We were very fortunate with those that were in the labor class, because there were other departments in the city that were continually hiring. We arranged that the people would be transferred to the sanitation department or others where they had vacancies. We had time and motion studies even to the point of when you go to a job how long does it take you to get to your truck and get a wrench, or how long it takes to put a nut on a clamp. I consider that one of the important things we did during that time and believe that the results of it are still in effect. Like so many things including master plans or long-range plans these have to be living procedures continually updated, modified, and reviewed. One illustration is in safety .If the top management of a company does not see to it that they have a safety officer (and the Water Department had a safety officer) who is supported in what he does, then the safety program slips and you might as well get rid of him just to save money. Robinson: While you were commissioner I understand you had other assignments and hats you were wearing. For example, weren't you involved in the construction of the new stadium? Baxter: No, I was not involved in the new stadium construction. One of the interesting things was the old stadium that had been built in 1926 for the sesquicentennial. It was built on what was originally the delta of two rivers and therefore had a very poor foundation. This huge structure, primarily concrete, had started to settle. Even though the stadium itself was not under the Water Department, we tackled the job. We found that the piles on the stadium originally had gone down a certain amount to a small clay lens and had held there for a time but most of the ties and piles had gone through the clay down to the silt. The job was to go in and underpin the whole stadium. We could tackle jobs like that because we had the right kind of people. The stadium by this time was under the Recreation Department, which had no engineers. And the job of going down and driving piles another 40 or 50 feet to pin that big stadium was one of the most tricky and difficult jobs we ever had. In connection with the stadium later on, in the late 1960s, this happened. Remember that the Army vs. Navy game is played there each year with about 100,000 people in attendance. Three days before the game, the mayor received an anonymous letter from a man who said he knew that the stadium was dangerous and would collapse. For two and one half days, as I remember, with practically no sleep, every structural engineer in the Water Department went over that stadium inch by inch. The letter talked about cracks. They looked for cracks or anything else that would indicate it was about to collapse. What the mayor needed was a letter from me saying it was safe and that he did not have to cancel the game. The mayor wanted that letter by 6.00 a. m. on the morning of the game. I would certainly want readers of this interview to know that although I've gone out on a few limbs in my life, I was supported by a lot of good people. We had another famous day at the stadium one Thanksgiving Eve when we had a tremendous snowfall. The stadium is all open with no cover. All of the seats had between 12-15 inches of snow on them. The field was covered. The Recreation Department was called in with a couple of their small bulldozers that they had. And I got the call sometime on Friday morning, just a simple question: Sam, can you get the snow out of the stadium? I grabbed every available laborer on the Water Department force, every available supervisor, talked a couple of my fellow commissioners to come in, brought in people from the highway division and the streets, brought in every last piece of equipment, hired equipment from contractors, pushed all of the snow off the seats down to the field, and hauled it off. Robinson: How did you become appointed the city emergency coordinator? Baxter: The simple answer is by speaking out loud at a time of a building collapse in which the rescue work was going slowly in my opinion. I said this ought to be done better, and right on the spot I was told, Why don't you do it? A very fortunate thing happened. I was able to get a crew and some cranes that could get into there and do the rescue work. And from that point on I became emergency coordinator. Baxter: That was Buck Sawyer who was managing director at the time. And then the thing was formalized by an ordinance that recognized in many ways the authority of the emergency coordinator. Basically, I had the power to call that emergency. Then I would have jurisdiction over all the departments of the city to cure or correct the problem. Now sometimes, perhaps, that emergency was a simple thing. There would be, for example, a gas explosion that might have wrecked two or three houses. To look for people that were trapped. With a main question being how soon to let the people into the adjacent houses, where they'd be safe from the gas explosion. Bugher: Is that position still there? Baxter: It's still there but not in the same way. This authority is now invested in the fire commissioner. The fire department handles many emergencies. Another phase of emergency management was control of snow-fighting units. We'd make complete arrangements for watching the storms come in, notifying the public, setting up emergency snow routes, and keeping general control over all departments involved. We did it not only in Philadelphia but also for about five towns down the Delaware. Robinson: Who made the decision as to what resources would be thrown at this emergency? Baxter: That was my responsibility. Robinson: So you had the responsibility of deciding what type of personnel and equipment were needed for any given emergency? Baxter: That's right. As time went along, you didn't have to make a decision like that every time something happened. Eventually many of the emergency procedures were done automatically. We had a very good control center. Bugher: Did you coordinate police activity as well? Baxter: If the police activity involved an emergency situation. I didn't coordinate the police activity, for example, if there happened t0 be a race riot. Bugher: Is that how you got acquainted with Rizzo? Bugher: Did you have some experiences that helped to develop attitudes or was there any friction or jealousies that might have evolved from that era? Robinson: I think that might require another tape. Do you care to comment on Mayor Rizzo? Baxter: Well I got along with Rizzo during those particular years. I think he was a good police commissioner. Although some people didn't like him, I thought he was strong in what he did and liked him. We worked together when we had to. When he became mayor he had the chance, as every new mayor, to appoint new commissioners. Anyone who takes a commissioner appointment in Philadelphia knows that he serves at the pleasure of the mayor. The mayor can put his own people in and in this case the Rizzo administration decided that they didn't want me. I was near retirement age anyhow, at least in terms of numbers. But I wasn't in any particular mood for retirement. But he made the decision and it was a perfectly proper one for a mayor to make; he had the authority. So I've kind of written it off. Robinson: Did you anticipate that this change was going to be made after the election? Baxter: No, I didn't anticipate it. But I knew at the end of November (and the election was in the early part of November) that I was not to be reappointed at the beginning of the New Year in January. Robinson: We've been discussing the professional side of your life up until now. I'd like to get into some other areas. Sam, when were you married? Baxter: I was married in October 1932. You might recall this was the time I had the choice between taking a promotion at a reduction in salary or being completely laid off in the Depression years. Robinson: What was Norma's maiden name? Baxter: Norma was Norma Winter. And we still live together. We'll be celebrating our 50th anniversary in October of 1982. We've had two children who have lived. Our oldest child is a son. He is a chemist employed by the Dupont Company. Right now he lives in suburban Philadelphia, although when you work for Dupont you move around so he's been other places. With him we have two teenage grandsons. We also have a daughter who was originally a schoolteacher and later a nurse. She married reasonably late in life to a man from New Zealand and lives there now with two very young grandsons. We're still together. We try to see one another frequently. Robinson: As a highly successful public works executive with tremendous demands placed upon your time, how did you work out balancing your public works and familial obligations? Baxter: Well, Norma put up with an awful lot of late dinner hours and a certain amount of traveling around. We eventually fed the children earlier because Norma used to say that the children would be waiting for their father to come home for dinner and start eating out of the peanut butter jar. Then, to kind of balance things out, whenever possible Norma would travel with me. I won't say that was done to sort of make up for the other things at home. We used to go to the New Jersey shore with the children when they were young. We added different vacations in later years. When they were gone from home, Norma and I traveled extensively through Europe and the Orient. Norma has gone along with me almost every time I made a trip. Robinson: How long have you been involved with the East Girard Savings Association? Baxter: Since 1929. East Girard Savings Association back in 1929 was a very small building and loan association, in the neighborhood where I grew up. The assets were almost nominal at the time because it was a small group. It was a neighborhood group that was doing the usual things building and loan associations do. And I've been with that ever since. We've grown from practically nothing to an association that now has assets of about $375 million. The last 15 years or so I've been board chairman. While I worked for the Water Department I served as a board member. I attended meetings but was not able to give it much time. But since 1972 I have had my office here and participate fully in all matters of policy, but I'm not the chief executive officer. The financial knowledge that I've gained, particularly of the real estate market, of the general financing procedures, things like that, were a real plus in operating the Water Department. I didn't have to depend completely upon the financial advice of others. I knew what an asset was and a liability statement looked like. I knew what it meant to go out and sell bonds, and this was a plus in my own work. I'm still quite active in it as board chairman of the association. Robinson: How long have you been active in the Boy Scouts of America? Baxter: Mike, I was a Boy Scout in 1917 until about 1920. I camped at one of the early Boy Scout Camps in the country, the Treasure Island Camp operated by the Philadelphia Council. And I was an assistant scoutmaster later on. Robinson: Were your own children active in scouting? Baxter: Our son was a Boy Scout, yes. I served on the property committee of the Philadelphia Council. I was particularly involved in two or three of its camping facilities. I later became property chairman for the council and later the district chairman in charge of scouting in a particular part of the city. Finally I became president of the Philadelphia Council. I still serve actively on its executive board. Robinson: Why do you support this organization with your time and talents? Baxter: Why? Because I believe in what a Scout movement does. I saw it as a Boy Scout myself. Once you become part of it, you just have to believe that if we can get the right leadership, this has a positive effect on the life of boys that are growing up. We teach them skills. They have physical activities such as camping. But we also try to teach the boys the responsibilities in life and that there's a right way to live and there's a wrong way to live. There are some critics of Scouting but I believe in those principles. Robinson: What has been your relationship with the American Red Cross? Baxter: During those years that I was emergency coordinator for the city (roughly 1954-1972), whenever we had people involved, for instance houses would collapse, or there'd be an explosion, things of that sort, it was the Red Cross that would find housing and meals for them. I had a long tie-in with them. Then when I left the city in 1972 the disaster chairman (Red Cross uses disaster instead of emergency) for the Red Cross in Philadelphia and four other countries had just retired and they had a vacancy. They asked me if I would be disaster chairman for the Red Cross. So I have been that chairman for 10 years. The responsibility for that job is the same as when I was emergency coordinator. Anytime that people need assistance in our local area, we provide temporary shelter--sometimes in school, in other instances maybe a small inn or hotel. We also provide food. If they lost their house, furniture, or clothing we provide these at no cost. Many people do not realize that Red Cross does that. Robinson: Is this if they don't have insurance? Baxter: If they have insurance, certainly we expect the insurance company to cover that. But we will help them to get that going. In an older city like Philadelphia, with a lot of poor housing, the people who live in houses that burn down generally don't carry insurance. If it's a modern apartment building, we find immediate relief and shelter for them, but by the next morning most of these people have contacted relatives or friends that come to their assistance. But there are so many other people who have no one to turn to for help. This position lets me have at least a little bit to do with the management of other things Red Cross does, such as the blood donor work which is very important part of its activities. It also lets me have apart in looking after the big disasters that the Red Cross becomes involved in, such as the floods on the Gulf of New Mexico. We send people to those places, both staff and volunteers. Robinson: Are you a regular churchgoer? Baxter: Yes. Since I've been married I belong to a Methodist Church but I belonged to a Presbyterian Church before I was married. I take an active part in the church work. I've been on different committees and still chair one of the committees in my church. I would say that religion is an important part of my life, but in no way would I want that to be read that I'm one of the so-called Moral Majority. If anything, I'm sort of a rebel within my own church. Robinson: Do you think that your church activities have taught you any principles that are reflected in your work with public works professionals? Baxter: Well generally speaking, yes. The community I live in is better off because of the church. It had at least some standards of what I would call decent conduct. Again this is entirely aside from what might be called the faith in the church. Robinson: I understand that you're active with respect to the Methodist Hospital? Baxter: I've been a trustee of that now for maybe 8 or 10 years. I keep active. I've served on about seven of its committees. I've overseen the hospital's construction program. It gets me back right into construction work where I can walk around with a hard hat on. Robinson: Why do you belong to the Rotary Club? Baxter: Again, it is a club that has standards, and I agree with them. They do a tremendous amount of work in this city. As a worldwide organization through the interchange of students it certainly must have some positive effect on what goes on in the world. Its fairness and decent treatment of people is good and I agree with that so I belong. Robinson: Have you ever been interested in the affairs of your old alma mater, Drexel University? Baxter: Yes. I've kept active in that. I taught there as an adjunct teacher until I went into the Army around 1940 and didn't go back because when I came back from the Army in 1946 they threw this huge program at me of sewage plants and everything else. But I did get interested in other ways. I was president of the alumni association for maybe four years, working up through committees and such. Then about 10 years ago I became a member of its board and some executive committees. Bugher: Let's go back to your involvement with our chapter here in this area. How about your first recollections? Baxter: You recall we did have a municipal engineers' society in Philadelphia for along time, way back in the 1920s. That group met once a month. It had a headquarters at the Engineers Club of Philadelphia, where affiliated societies met. That group met before APWA was founded. They always had one big dinner each year, which everybody attended. Because Hoffman and Buckley were active in the organization, as part of their interest in me, I was brought in to be a member. I don't exactly know how far back my membership in that group goes. But I was given assignments to do. Even if it was a simple assignment like lettering the place cards. Then as time went on everybody was encouraged to attend meetings. I think I mentioned in my paper that Tom Buckley used his office as assistant chief engineer to encourage attendance. By 1937 I was then president of the Philadelphia Chapter of the new APWA just formed at that time. I was still a comparatively young man. I was 32 and there were a lot of older persons it could have gone to. Looking back on it I think it was perhaps only because I had taken an active part in the committees and was willing to work on them. Bugher: You did not go to the first meeting down in Atlanta? Baxter: No. One thing to remember is that these were Depression years and the city was not paying the way so you'd have to dig into your own pocket. The first meeting that I can remember attending was the one in Rochester, New York, which I think was 1939. So from that time on I kept my interest in APWA and as a result of being president of the Philadelphia Chapter I became a director of APWA and then started up through the ranks. First of all there was a long succession at that time which started I think with treasurer, then one or two terms as vice president. I would have been president during the war years, but was on active duty and it was not possible. So I was passed over and became national president in 1947. I continue to serve APWA. I served and helped the Research Foundation and I think I was a chairman of it for 15 years. Bugher: Sam, you of course have been active in a number of professional organizations. Before you comment on some of them--you alluded earlier to some of the different methods like using pre-stressed concrete and so on--could you recollect some experiences from your association with these professional groups that have been helpful in carrying out your responsibilities for the city of Philadelphia? Baxter: Bob, if I recollect them I could keep on talking for a long time. As I've said so many times, I obtained a number of ideas and thoughts at national and state meetings. You didn't pay attention if you did not walk away from each meeting with at least one new thought or idea that you could practice, one that you hadn't heard of before. So that when I was in a position to designate which people might go to the meetings, I would let the men go comparatively low on the staff. We used to send them primarily to state meetings of different organizations or to national meetings if they were capable of writing a paper, as long as they paid their dues. My own thought was that as long as they read the organizations' newsletter, that was a plus even if they only read one of them. In the Water Department, anyone from supervisor on up could go to the state meeting for two days on an every-other-year basis. Sometimes I was criticized for the number of people that went. But I knew the value I got from those meetings. Sometimes it was a technical procedure, lots of times it might have been a better thought on organization or management, and I can't over-emphasize the importance of this: the opportunities to meet other people who were higher up on the professional scale. I will always appreciate the fact that these men, much my senior, would take maybe 10 or 15 minutes to talk to a young fellow from another city about just anything. As the years went on, I tried to do the same thing. As an officer, when a younger man wanted to talk to me about something I would find the time. That was the way I could repay all the professionals who found the time for me when I was young. Bugher: Did the Water Department have a means of fixing the value of its assets? Baxter: The answer is yes and no. We did have a figure showing our assets in general. But Philadelphia's water system was first built in 1799 and continually built upon from that time on. Trying to put an evaluation on some of the old plants and underground systems just had to guesswork. One thing I never wanted to do was go before the Public Utility Commission with an adversary lawyer and have him ask me to defend the source of every one of the things that went into an asset because it's just not possible. But we did have an estimate. In some cases, we just had to say so many miles of pipe built before 1850, and how do you put a price on an iron pipe that's still in service after 100 years? Bugher: Is there a replacement value that as a rule of thumb could be used advantageously? Baxter: Yes. Of course that is a point that is challenged always in utility work before the utility commission, whether it's the replacement value, whether it's the original value less depreciation. And if you base cash rates on that type of thing you can get into some terrific arguments, appeals, and everything else. Bugher: So you don't have a comprehensive inventory right now of all the physical facilities? Baxter: Oh yes I have it and think we still have it. Bugher: Getting back to your involvement in professional organizations, can you think of any instances in your presidency of AWWA, ASCE, or APWA, particular individuals that you worked with during those years that you'd like to relate to us? Baxter: Let's take ASCE as a beginning. I became a junior member of ASCE in 1926 when the annual convention was held in Philadelphia. My boss was active on a committee and he wanted someone to take the delegates on the buses around. So I've had membership in that society for more than 40 years. I became president after going through the usual chores serving on different committees, which is where you do a lot of the work like obtaining speakers, etc. If you work on different committees, somewhere along the line you become a member of the board and if you do your work on that board you become a president. So I became president of the Philadelphia chapter. I gave papers eventually at national meetings on different topics. Bugher: Well you certainly had the opportunity to get acquainted with a lot of leading consulting engineers and educators in civil engineering. Baxter: That's right. There wasn't any large engineering consulting firm in the country in which I did not know one of the partners by first name as well as many of the other partners. Bugher: You were involved in some international activities as president of ASCE, weren't you? Baxter: Yes. The ASCE belongs to an international society and during my year as president the meeting was in Bulgaria so I had that long trip to take in some of the Iron Curtain people. Through APWA as well I participated in some international things by giving papers. I remember giving a paper at Barcelona, and I gave one in Vienna on waterworks. Bugher: Were there other employees of public agencies on the board at the time you were president of ASCE? Baxter: I'm not to sure except to tell you that I could check. Bugher: Well we can check the record but I don't know of too many public works people that rise to that level in ASCE. Baxter: I was also active in the American Water Works Association. Prior to the time I became water commissioner I had not been active in AWWA. The old Water Bureau had been handling it and I had been active as a member in the Water Pollution Control Federation because the engineering bureau had operated the sewage plants. But beginning around 1950 I became a member of AWWA. Because I served on committees was finally as chairman of a committee, board member of the Pennsylvania section, president of the Pennsylvania Section. Each step was a more difficult one. I still keep active with AWWA and some of its committees. Bugher: You were first president of APWA. Baxter: Yes. Then AWWA and ASCE came along. Robinson: Just for the record, you were president of ASCE in 1971 and AWWA in 1966. Bugher: You are for sure the only person I have ever known that's held that honor in all three organizations. I think Bill Hurst was President of APWA and AWWA. Is there anything you remember about your term as president of APWA? Baxter: One thing particularly. It has to do with a name that perhaps Bob, you remember, but most APWA members wouldn't. The name was Spellman. The Spellman Fund. As APWA was getting organized after 1937, it got a grant from the Spellman Fund--Laura Rockefeller Spellman. She organized a grant in her name and it was a grant APWA had to match somewhat and it was a descending grant. The year I became president was the first year we didn't get the Spellman credit. That much I remember. There was a blank in the budget for that year for that grant. I remember the chapters were much smaller and there weren't much funds for the president to travel on. Robinson: We hear a great deal in public works these days about revenue shortfall, spending limitations, and the consequences of these two factors for the urban infrastructure. If you were in a position of leadership today in public work, what are some of the measures you think you might try to pursue to overcome these problems? Baxter: A great deal of correcting this problem, particularly the one of shortfall, is going to have to do with public information and information from people whose opinion is respected. I talked earlier about priorities on the subject of water rates. What is important to people living in an urban community? What priorities do they set on things? My own thought is that we have put our priorities in the wrong place. Public works systems have to be maintained. The idea of keeping bridges so that cars don't crash through them, the idea of making sure that the water system not only provides water, but clean water, and making certain that it also provides for fire. The thought that sewers were built years ago, and sometimes collapse and cause trouble--that's important. I gather these things don't have top priority. And we have put our priorities on other matters. But how do you change it? I think history shows that it's going to take along time. It will take people who are going to be talking about this who are not even going to be accepted in the beginning as they start to talk about it. Robinson: Do you think that the professional associations have to be more aggressive in making the public and perhaps leadership of this nation aware of the need to maintain our public works facilities at an adequate level? Baxter: Yes, I think that but then I make this point. Many of our professional organizations have pushed for building new facilities. Using lot money, for example, to get into secondary treatment where perhaps primary treatment would do for the time being. Or trying to correct the evils (if evils they are) of all within a very short period instead of placing it and spacing is all out. Many of those associations are protecting themselves. Beginning at least five or six years ago, whenever I had a little column that I was able to write, I suggested that we stop completely the granting of any funds for sewage treatment until at least we had started to straighten out this matter of inflation and the federal deficit. There was no agreement on that particularly during the last administration in Washington. The new administration has talked about it but as I talk, instead of the $4 billion a year, it's now down to $2.4 billion a year. The years have been stretched out a little bit more, but I would cut the whole thing right out until we straighten out this inflation mess. Because here we are now building these treatment plants. Most cities do not have enough people and enough trained people to operate these sophisticated facilities. I've seen numbers by people who supposedly know that 50 percent of the new plants are not being operated the way that they were designed. Maybe in terms of sewer money the cities should replace their old sewers, rather than try to upgrade treatment plants and make the rivers and lakes pristine pure. So now at least we've cut a little bit back but not enough. Nobody is more concerned about defense, I think, than I am. I've seen what the enemy can do. I'm afraid of what the Russians might do, and I agree with the general idea that we should be ready to face them. I keep an active interest in military affairs. I still keep active in the American Society of Military Engineers. I attend their meetings and am president of the Philadelphia post. I say, therefore, that if we can cut back substantially on the social entitlements, cut back on these grants to sewage treatment plants for awhile, I would be willing to say even cut back some of the strong support of the military--these would help. Only this morning I heard one of our congressmen from the area criticizing the social cutbacks, I don't know how we're going to correct this shortfall unless we start doing something about it. Robinson: How have the relationships between the municipal government and the state and federal government changed during your professional career with the city of Philadelphia? Baxter: Certainly from the 1930s as compared to today. Forgetting about the PWA and WPA projects that the Federal government got into during the 1930s, cities were able to make the decisions they wanted to on nearly everything they were doing. They designed their own water plants. The only controls, for example, over water by the federal government was the Public Health Service which controlled water used in interstate commerce on trains. That was the only control that the federal government had. When it came down to sewage treatment and the rivers the only regulating agency was the state governments. Then, as time went on, we found the federal government getting more and more control. I recall when the federal government started to give the cities a small amount of money for sewage treatment. A percentage which sounded like a lot but with a limit on the total. But that was the camel getting his head under the tent. As I remember as time went on that camel got further and further in the tent, until instead of just giving some money to help, the federal government was in control. I said one time, as the camel kept getting further in the tent, The camel stinks--and I've been on a camel's back, so I knew for sure about that. There is something else to be said. The reason the federal government got in was the vacuum which the cities and the states allowed to exist. They allowed their rivers to become polluted more than they should and the federal government eventually came in. They allowed many of their water systems to turn out water below a certain quality level and the federal government walked in. The more they walked in the more money they put into it and we, the people, in the cities accepted it. In fact we began then to think that it was owed to us. Robinson: We find now a definite change in direction, at least at the federal level and I think we can say for the foreseeable future that many of the federal programs are going to be either cut out or reduced. Do you see this as a positive step in the right direction? Baxter: I see it as a positive step primarily because it will reduce the federal deficit. Robinson: To what extent can public works officials use productivity to solve some of the current problems they now face? Baxter: I think the basic one they can do is to work on their manpower. There is a generally accepted thought by citizens in general, particular in municipal government, that there are just too many people in all sorts of public jobs. That may not be true in a lot of cases but perhaps it is true. I know from my own experience that even a well-run shop can reduce its number of employees. It's more than just dropping off people. It is doing such things as work scheduling, finding better tools (and I don't care whether the better tool is a better wrench or a refuse compactor), making certain that the people have the right tools, making sure they are organized in the right way. This results in productivity and shows up in the budget. I wish to say something which I wrote recently about people, particularly the managers and engineers in public works. I say that there are far more dedicated, able people than what most people realize. But then, we can still do better. We can still get out and get after top-level people in graduating classes. I've known many qualified and able people throughout the years. Let's not downplay that. I think there are just not enough of them, that's the point. Robinson: Do you see significant changes beginning to occur in the relationship between the public and private sectors of government with respect to public works? Baxter: Well let's look at it in one field of public works where there has been a relationship, which is waterworks where there are private waterworks investor-owned utilities and there are municipally operated utilities. Those people that advocate private operation ought to realize that the private market has not been increasing in terms of more investor-owned utilities. In fact, if anything, the trend has been slightly the other way around. In some instances, investor-owned utilities have been taken over by either a municipal authority or municipal department. Just in our local area of Philadelphia, the big Philadelphia Suburban Water Company, a very fine utility, became part of the larger conglomerate which did other public works and other facilities. And recently that conglomerate divested itself of the water company because that water company wasn't making enough money. Bugher: Is it feasible for one governmental agency to build the facilities and then have management contracts with private sector so that the huge sums of capital required and the service area that is needed could be the responsibility of government, but the efficient operation of the facility and use of manpower be in the private sector? Baxter: Yes. One of the problems, which I saw in an article recently, partially answered it. The suggestion was that this was one method of doing so. The author suggested that the management group would do the work at the lowest possible cost. But when you do something at the lowest possible cost, particularly with a management group, you have to name the right specifications to show that they will operate at the lowest possible level. And who determines this lowest possible level? Many would want to fix a cost to make the rates as low as possible without thinking too much about getting the lowest possible service. Bugher: I think that's true. There isn't an optimum solution. Robinson: Sam, in your career in public works you've met a lot of people who were fine professionals. What qualities do you see in an individual that rises to the top of his profession to become a strong, professional public works leader? Baxter: I guess the quick answer is that it be somebody who says they want to dedicate themselves to public service. There are a lot of people that dedicate themselves to professions which are public service and they know when they start that they're not going to get rich or even have excessively high salaries. So I think that the people that get into public works still have that particular point of view. They see an interesting job. I know my time in this field has been interesting. Even today I approach every day as I have most of my life -eagerly. There are other people in this world that have that approach. Take the men who go into the clergy, for example, or even especially know that they aren't going to accumulate any substantial amount of money. But people do it. There are many other aspects but I think dedication is what motivates us most. Plus the fact that you're working for and with interesting people. There are others who see what they want to do and get into a related profession where they can make a lot of money. These are people that have a different approach than public works professionals. They are the ones that establish private businesses and become wealthy. I'm going back to Tom Buckley because I can remember him telling me why he switched in his very early days from working for a consulting firm into city work. He said he didn't want the money coming into his hands but going into someone else's. In my own experience, I had the opportunity to go into private business with a big contractor after World War I but I don't regret it. If we want to bring better people into the profession we're going to have to go out and sell ourselves. I believe that one of the strengths of the Philadelphia Water Department was that we sold ourselves to potential public works people. But it takes money. I remember what I said to the man who offered me a position in his privately owned business after the war. I said for all my life I have been on what might be called the owner or engineer's side of construction work. If I go with you, I'll be on the contractors' side where the main thing will be to make a profit. Where I am now I'm at the spot where I try to do my best and get the best kind of results. If I go with you, and if I'm going to make a profit along with you, then on every contract I'm going to judge the specifications and that's an attitude that I don't have right now. My attitude is I'm going to do the best even if I don't get any return for it. But if I go with you as a contractor, you're going to expect me to make a profit and on any contract not to do any more than I have to do. I can honestly say that I'm glad that I stayed with the city of Philadelphia. Let me put this in and I hope you would put it in at the tail end when you're editing this. Let me say personally that I am familiar with the fact that time and distance not only lends enchantment but exaggeration as well. While I have not deliberately exaggerated my own importance in all the things we talked about, I'm perfectly aware that such things can creep into an interview such as this. Robinson: Mr. Longstreth, could you tell us your current position in the city? Longstreth: I'm president of the Greater Philadelphia Chamber of Commerce and have been now for 18 years. Both prior to my assumption of that position and since, I've been a candidate for mayor in Philadelphia. I was a Republican candidate in 1955 for mayor against Richard Dilworth and again in 1971 against Frank Rizzo. I was beaten pretty badly the first time and got pretty close the second. In between I served four years on the city council. So I have had a good exposure to this community and an opportunity to evaluate the performance of various public servants. Robinson: How long have you known Sam Baxter? Longstreth: Since 1951, 1952 really. He came into his position as head of the Water Department in 1952. I've known him since that time so it's roughly 30 years. Bugher: Could you tell us a little about the reorganization that took place at that time in the city government? Longstreth: Well in 1952 when Sam came in our Water Department was in pretty sad shape. It hadn't been really touched very much for a number of decades. It had a lot of rundown equipment that was characteristic of most water departments in large Northeastern cities at that time. Leadership during the previous decades had been less than outstanding. The mayor looked around the country for the person who was the best in the business, and it was no coincidence that it turned out to be Sam. Sam's reputation, even then, was outstanding, and really the whole question was not who could they get, but rather, could they get Sam Baxter. When he came in he instituted a long-range program of totally reorganizing that department. In raising the monies that were necessary to carry the enormous improvements that took place in the capital structure in the Water Department, and the institution of policies in the administrative direction that made it I think the best operated of any city in the country. You would really appreciate the significance of this if you sit where I sit and look at the problems that face Philadelphia today. We have energy problems, school problems, crime problems, tax problems, but we don't have any water problems. One of the blessings that recent mayors have really inherited from Sam Baxter's administration is that we have not had to worry about our Water Department or about our supply of adequate clean water. When you recognize that we have gone through three very serious droughts in this area during the last 30 years and you recognize that as recently as a year ago we were in almost desperate circumstances across the Delaware River in New Jersey and in certain parts of southeastern Pennsylvania, when you recognize that we had no water problems at all in Philadelphia and certainly no anticipation of any, I think it tells you something of the legacy that Sam Baxter has left us. Robinson: Do you recall some of the reforms he instituted when he took over as commissioner? Longstreth: Well the major thing was bringing competent people in under him. Several moved into the management structure after Sam retired. He trained a cadre of highly qualified men who not only took over in Philadelphia but who also moved to other parts of the country. These Baxter-trained water experts are among the nations most outstanding. So his identification of, and recruitment and training of qualified people were among the primary activities of Sam Baxter. He also recognized that there were going to have to be some improvements and modernizations made that were going to be very expensive. I think somewhere in the neighborhood of $1 billion over a period of several decades, but obviously those expenditures not only gave us a water system that worked as far as Philadelphia was concerned but we now sell water to a great many of the surrounding communities on the Pennsylvania side. Robinson: How does Sam relate to the private sector in this city? Longstreth: He is recognized by us in the business world as a talented engineer. We respected his knowledge and his ability to put together a water system that was outstanding. And as you might recognize, that was particularly important to those manufacturing industries that were water dependent. If you have a good water system and it's well run and if it's efficient, etc., it makes a tremendous difference in your ability to maintain a manufacturing establishment. If you don't have that, you simply go someplace else. One of the top attributes that this region had for the last 30 years is this adequate supply of water. Not just now, but also projected into the future. So a manufacturer that's planning ahead knows that he's got enough water now and he's going to have enough 20 years from now. This again is apart of Sam's legacy. Robinson: Do you think that he made a major contribution to the overall economic vitality of the city? Longstreth: So much so that if we'd been able to match our adequacy of water supply with adequacy in cost of energy, and a better highway system, and perhaps a better (stronger) labor force, we'd be in a much better position today. Water is essentially our number one asset at this time. Some of our other assets, unfortunately, are not quite as strong. Bugher: As a great man as he is, he must have had some problems with the council from time to time and particularly with some of the mayors. Anybody that's respected that much must have said things politically that from their point of view might have been a little bit touchy. Longstreth: Well, Sam is a very blunt man. He calls them as he sees them. Sometimes that gets you in trouble with the politicians who don't want to hear things as they really are. They want to hear them as they'd like them to be. Some of the councilmen used to feel that Sam was pretty arrogant in his treatment of the council. My own feeling, and I was in the minority so I could afford to be perhaps a little bit more charitable in my evaluation, was that he was calling the shots in the proper way and the council sometimes didn't like to face up to the fact that we needed to charge higher rates for our water. As you probably know, the water system in Philadelphia is self-supporting and you have to have as much income as you need to keep the system going and to payoff the bonds and things of that sort. In this respect, you always knew where the system stood with Sam. He would call for rate increases sometimes that were not politically expedient. And when the councilor the mayor would try to get him to change his mind, he'd just simply tell them, No, this is the way it has to be. He did make some enemies because of this. I think that any strong man can often be evaluated in a more positive vein by which his enemies are rather than his friends. Bugher: How did Sam get along with the other department heads? Longstreth: Again, some of the other fellows used to get angry at Sam because he insisted on having his way and he usually got it. This made some of them jealous. He was very blunt in his reactions to some of their criticisms of his activity. He sometimes called the shots of some of the departments of the city that were not run as well as the Water Department. He never minced any words. Sam had an advantage in that the Water Department was a separate entity. He had to produce his own income and except for those areas of political disagreement where water rates were, let's say, raised in an election year, as they were the time Iran for mayor. Except for instances of that kind where the mayors didn't like and would oppose him on it, he got along pretty well with everybody. He enjoyed a degree of prestige and acceptance pretty much across the board that very few public officials will ever enjoy in their lifetime. Part of it was his competence, part of it his honesty, and part of it was simply because anybody that worked with him felt that this was a very extraordinary man and that you were able to deal with him totally openly and honestly. Bugher: Can you think of any situations where he demonstrated sensitivity to the political issues of that particular time? Longstreth: No. If he had a fault it was either an inability or unwillingness to acknowledge the political situations. He just did what he thought to do in terms of the Water Department, and he was strong enough to get away with it. I'll tell you that a lesser man would not have survived for 20 years if he had run afoul of management as many times as Sam did when he felt he was right. Bugher: You're familiar with the circumstances under which he left the city, aren't you? Bugher: Would you want to comment on them? Longstreth: Yes. As a matter of fact it has entertained me a little bit inwardly because I ran against Frank Rizzo for mayor in 1971. And I publicly announced that if I won, the two men I would keep in my cabinet, if they would be willing to serve (and they had both expressed a willingness to serve) were Sam Baxter in water and Bob Crawford in recreation. And Rizzo, without specifically saying it, somewhat intimated the same thing. It was somewhat generally concluded that when Rizzo took office that Sam would be continued in the job of running the Water Department. By that time, he was close to the retirement age, but one of those ageless men so that really the years don't make any difference. All of us, including myself, simply assumed he would be continued by the mayor in the position he had occupied for 20 years. Much to our surprise, chagrin, and disappointment, he was not reappointed. I think it was done primarily because of a personal antagonism that existed between Sam and Frank Rizzo. Robinson: Would you care to comment on his other kinds of community service? Longstreth: Of course, Sam's activities in the Northeast where he lived, his activities in various charitable and civic involvements, were manifold. He was involved in all sorts of community things. I'm involved in a great many myself and so we used to be together a lot, because of this common interest. Mine was more or less citywide while his was more concentrated in the Northeast. Bugher: When you were a member of the city council, surely there must have been some kinds of issues that would crop up, other than Sam's independent action in raising rates, that he had to deal with the council on. Can you think of any examples where the location of facilities or some other issues caused problems? Longstreth: Oh, there were several instances where the councilmen in the district wouldn't want a facility to be in a particular place and who had constituents that would object to it. This never bothered Sam. He'd just put it there. In his testifying before city council, we were all sort of in awe of him. That's a discipline that, if you're not an engineer, you don't really know much about. None of the members of council were engineers nor were any of us really very well acquainted with the technical background of running a water department. So we were kind of outmatched. We never gave him much problem when we had the hearings. We pretty much accepted at face value whatever he told us because none of us had the expertise to really challenge him. Robinson: What about his rapport with the press? Longstreth: I think he had good rapport with the press for somebody who was as outspoken as he was. Usually, the press will give you a pretty hard time if you're as blunt and direct as Sam. I've had a problem with the press myself on frequent occasions, simply because I've gone ahead and said what I thought. But in Sam's case again, he was always right. How do you pick on a guy who experience has shown on a whole series of decisions made over along period of time come out right again and again. I feel that the press had almost the same kind of respect for Sam that many other Philadelphians did. He was just somebody you didn't pick on. He became such a Philadelphia institution it was considered unthinkable. Robinson: How do you feel that Sam is regarded here by others in the engineering community? Longstreth: I think in the field of water engineering Sam Baxter in this area is looked on as almost a God-like figure. I really don't exaggerate at all. He's really venerated and respected to a degree that I can't see in any other field. I mean, it's one of those extraordinary things that you can only achieve over a lifetime of performance. Bugher: We have a Public Works Historical Society of which Mike is the executive secretary. One of the things that we're doing is going back through history and identifying certain people who had similar traits that you're speaking of. I'm just wondering if anything has been done to try to preserve for the future the positive impact of public officials for young people to imitate? Longstreth: No, I don't think so. As a matter of fact it's somewhat to the contrary right now. Our city council is in such disarray and our city is in such financial straits at the moment that, really, the people in positions of power are more concerned with living from day to day almost than they are in something of this kind. I think that will happen later on. It usually doesn't happen during a man's lifetime. And you're not really appreciated until after you're dead. But Sam is one of the few people I know who has achieved that remarkable status of appreciation and gratitude while he's still alive. It's an interesting phenomena. Robinson: Do you see people of Sam Baxter's quality moving into jobs of responsibility in the public sector? Longstreth: Well, I think everything is compared to what. I would suspect our leadership in public works in Philadelphia is in the forefront of other large Northeast cities. That's essentially in the Baxter tradition. I think that many really competent people who could possibly be developed into another Baxter are going into the private sector simply because they can make more money there. Robinson: Do you see an attrition of talented people from the pubic sector? Longstreth: I sure do. As a matter of fact almost every time a really good one surfaces some private company comes along and grabs him off. Bugher: What do you think could be done to change that in terms of city government? Longstreth: One of the things that's going to have to be done is to develop a much more realistic pay scale than the one that is presently available. You see what's happened is that the advent of public unions has brought the mean average wage for city workers up to a very high level. At the same time, it has reduced the numbers between top managers, middle management, and the rank-and-file worker. So today, while in private industry you have a rather wide gulf between the guy that's running the show and people further down the line, in city government there's really no gulf at all. It's a terrible idea to have your managers making virtually no more than the fellows who don't have responsibility or the pressure on them. Bugher: Do you see much prospect in the sense of a political issue about that? Longstreth: Oh, yes. It's come up. It's happening essentially on the basis of supply and demand. The biggest problem that we have now is that it's very difficult to create jobs that pay more than the mayor gets. You can understand this. It really isn't fair because the mayor is at the top of the pyramid and that's where the buck stops. And it isn't fair because the mayor is called on the make all the major decisions and he gets the blame for the ones that go wrong. Yet the electorate invariably refuses to permit him to make what would be commensurate with the importance of this job. Bugher: Doesn't it almost mean, though, that outside forces that recognize the importance of this have to take the initiative more so than these people? Longstreth: Oh, absolutely. That's why, for example, the Chamber of Commerce has testified repeatedly in favor of salary increases for key officials. When those recommendations come from a disinterested outside group like that the chances of their being implemented are much greater than when they're looked on as sort of self-serving moves that come from within government. Bugher: It seems to me that I agree with what you say. When community leaders realize the tremendous investment they have and the dependence of the private sector on the public facilities, and the importance of providing adequate maintenance funds to preserve the big investments that they have, it's only going to be then that they realize the importance of paying for that. Longstreth: Absolutely. And you see historically in the old days we paid our public servants substantially less and justified it by both the patronage system (where you got and lost your job in terms of who got elected) or job security. Today that's no longer enough and we really have to step up, particularly for key officials, the pay scale. If we don't do it we're going to keep getting mediocrity or worse. Robinson: Do you feel that the business leaders in this community are sensitive to the issues that you've been discussing? Longstreth: Absolutely. Probably as much so as any big city in the country. They're very much aware of that and very supportive. Bugher: Well you've been very helpful. Robinson: I think I'm running out of ammunition. Bugher: Are there any parting comments that you would like to make? Longstreth: No. The only closing thing I'd like to say is that one of my major regrets is that, never having been mayor of Philadelphia (and as you know, I've tried several times) I never had the opportunity to work directly with Sam Baxter. Because I have admired him all of my life about as much as anybody I know. Bugher: Well, I feel the same way. I've had the pleasure of working with Sam, of course. He was the president of our organization before I came on the scene. He was chairman of our Research Foundation for years and I worked very closely with him during that period of time. He has the respect of our membership throughout the country. Longstreth: One of the things that I love about him is that you get a guy like that and their egos grow at least commensurate with their abilities, and sometimes even at a faster rate, but not this guy. Bugher: No. He's down to earth. Longstreth: He has stayed just the same way the 30 years I've known him and I wish there were more like him.